As with all my other builds I wanted to give this a little different look to factory on the exterior. The last FD had the burnout kit which was okay. Maybe not to everyone’s taste and for me just slightly too sharp around the arches. I wanted to go wide again that was for sure, partly because I would need some extra room for rubber! But, I also didn’t want to detract from the smooth and curvaceous factory styling that already existed. Maybe just muscle it up a bit! It didn’t take me long to find what I was looking for. The Origin Lab wide body kit. Finding it at a price I was willing to pay might be another story! So after some looking around I came across a very similar kit available from EP Racing. This was essentially a copy with slightly different styling on the front arches. 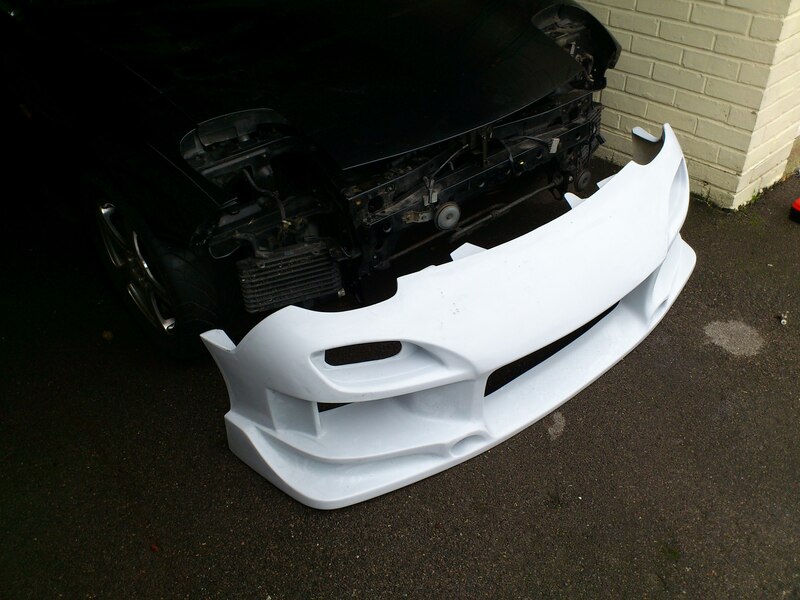 So I order an arch kit and side skirts in and sourced a front bumper that I preferred and hoped would match! I was still unsure which way to go with the rear end. I will be doing some test fitting so you can see how the kit looks soon. 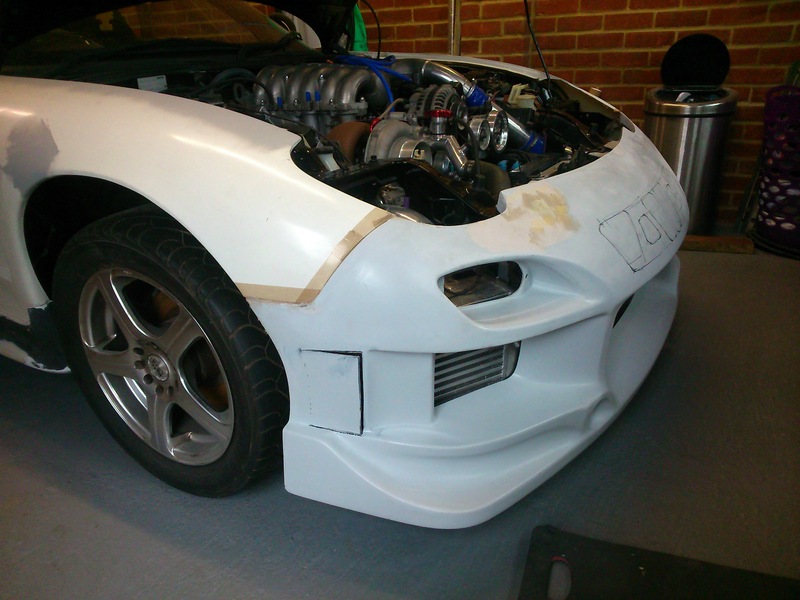 While the winter weather set in and there was not much opportunity to really work on the car mechanically I decided to test fit the body kit panels I had recently purchased. The kit supplied by EP Racing looked pretty good on the face of it for a copy kit. And it came pretty much drilled off and trimmed out ready to fit which it unusual! 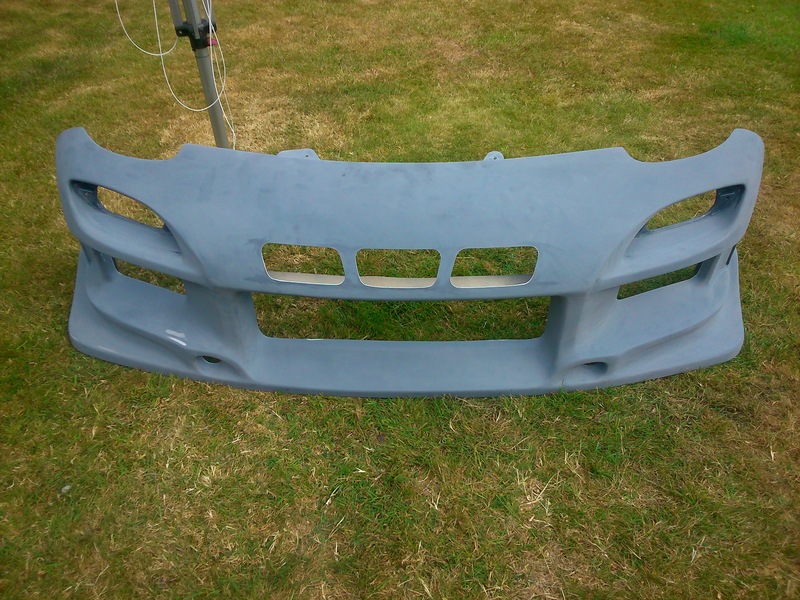 The bumper I had sourced separately on the other hand was not drilled off and would require a little attention. Much to my amazement, from previous experience with copy parts, the front wings matched up almost spot on with very minor adjustment to the factory front bumper. The driverside wing was slightly reluctant and would need a packer halfway up at the door end to keep it pushed out from the A-Pillar and prevent the door catching it when opened.. but should be no big headache to sort out. So a big thank you to EP Racing for supplying a quality kit at a great price! As you can see the bonnet and wing gaps are very good. Just a couple of areas of slight mis-alignment where the moulding is a little distorted. You will also notice that I fitted the Wings with the stock Bumper and visa versa. Reason being that if there was a fitment issue I would be able to pinpoint it that much easier rather than if I fitted it altogether! Time to get the engine in the bay now.. but once that’s done I will move onto the rear end and start filling and prepping the panels. 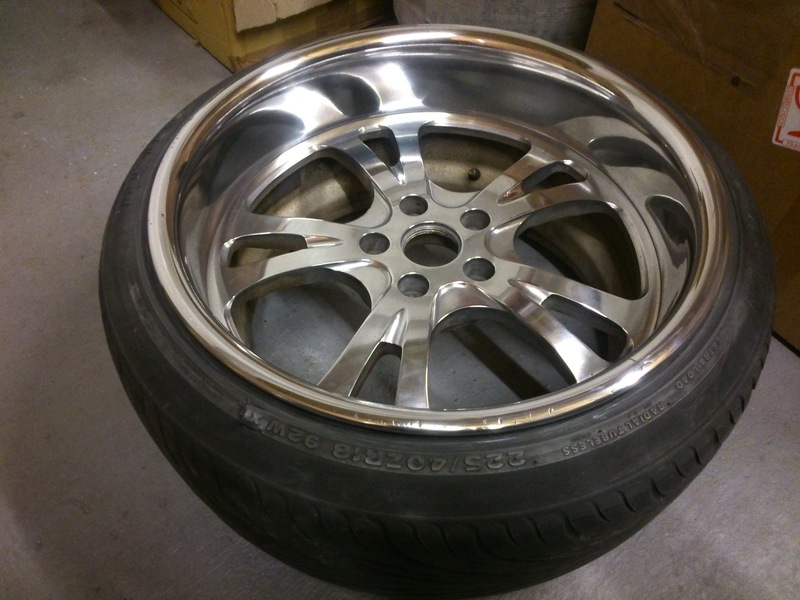 A long while back now I picked up some nice deep dish alloy wheels. One of the set has a nasty ding in the lip which I hoped I could fix. Well finally I got around to fixing it! Here is the before and after shots. 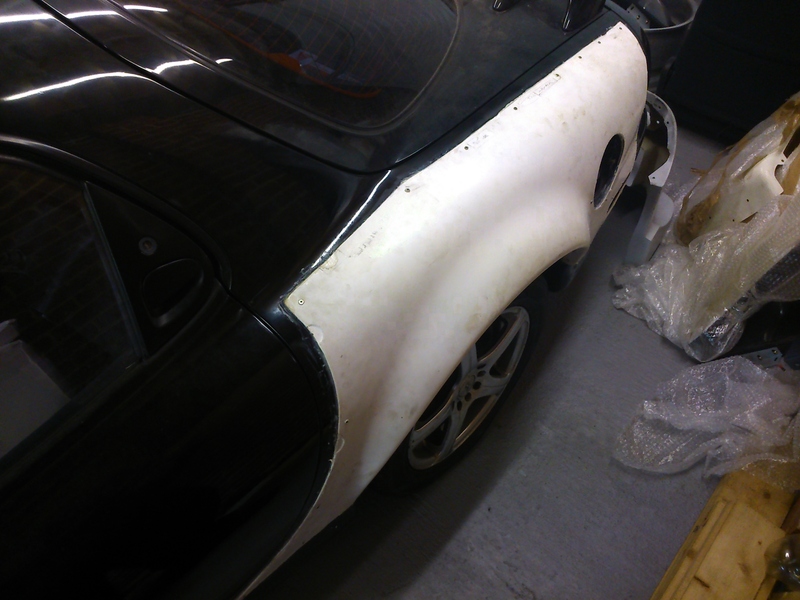 To be honest the damage looked worse in the flesh and there were two spots that needed sorting. 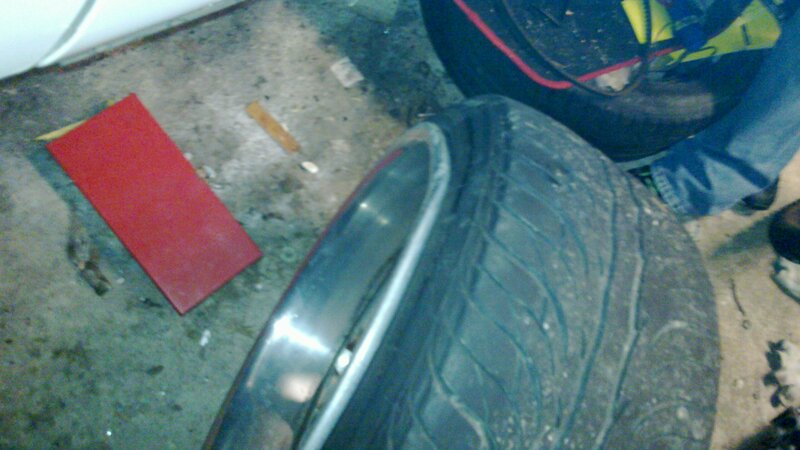 Plus side was the rim was not buckled and had not damaged the inner lip. First of all I had some formers made that sat in the inside diameter of the rim so I could use them to press out the slight flat spots. 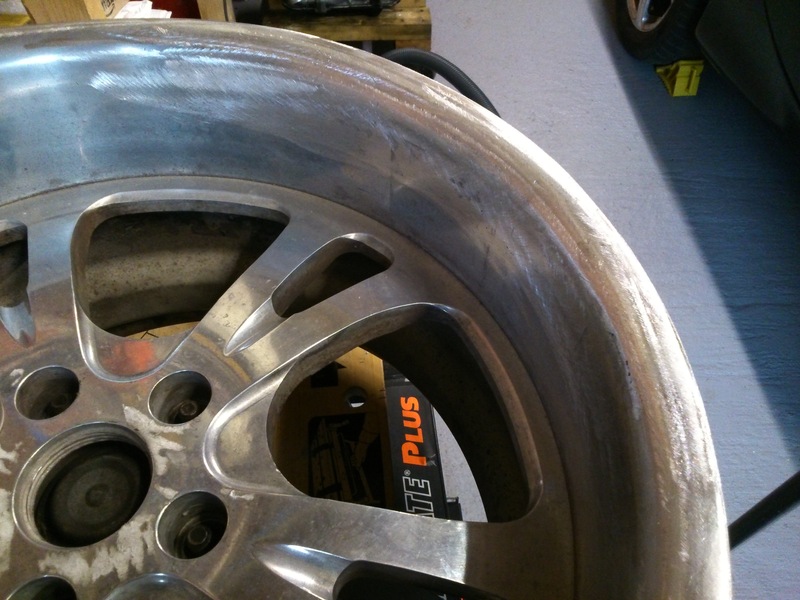 As soon as I started trying to move the rim I could see that it was very well made and was going to be hard to budge. Even with some heat and I did not want to soften the material too much. I then found a local company that did metal spinning and they said they could have a look at reforming the lip on one of their machines. After a few days they came back with a much improved rim. The worst was out but not good enough. So out came the formers again and this time I decided I had to go all out. So after a lot of pushing pulling and gentle persuasion with a large mallet I got the rim back straight within millimeters. All that was left now was where the edge was a little bit low on material due to severe curb rash. So I spoke to my local welder and asked to run a bit of weld into the lip that I could then dress back. This is how it came back. I have spun it up on a hub and it looks pretty damn good! A bit more elbow grease to go into it yet to get it all flatted and fully polished up but then it should look pretty much bang on. Good result so far. I will post some more pics when I get a bit further along! I managed to fit in a little bit more work on the wheel between other jobs. A lot of flatting through the grades of wet and dry after knocking the worst back with a air sander. But it was coming along nicely. I even took it to the local tyre fitters and had it spun on the balancer. Was pretty damn good! Very pleased. Now I just need to polish it all up properly and then do the same on the other 3 wheels! 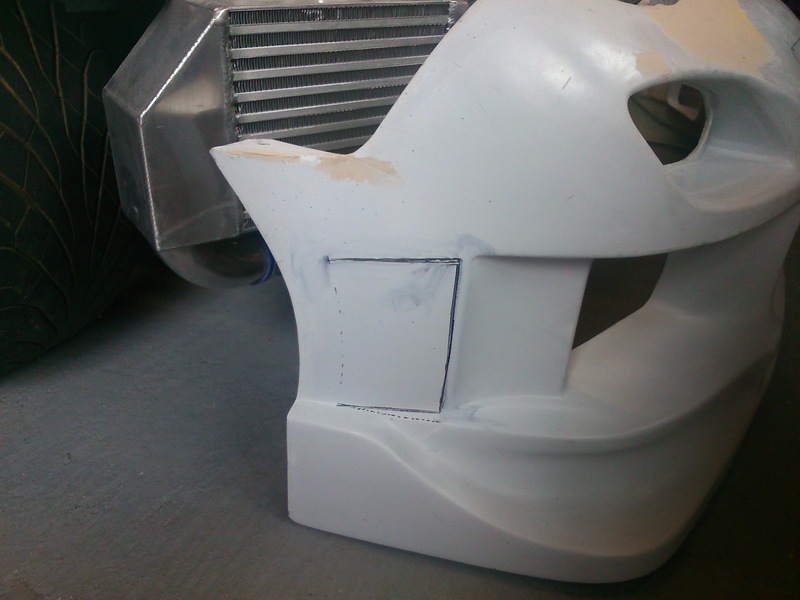 With the engine now running I though I would take some time to do a bit of the bodywork while the weather was nice. With the hope I might be able to get some spraying in before winter sets in. 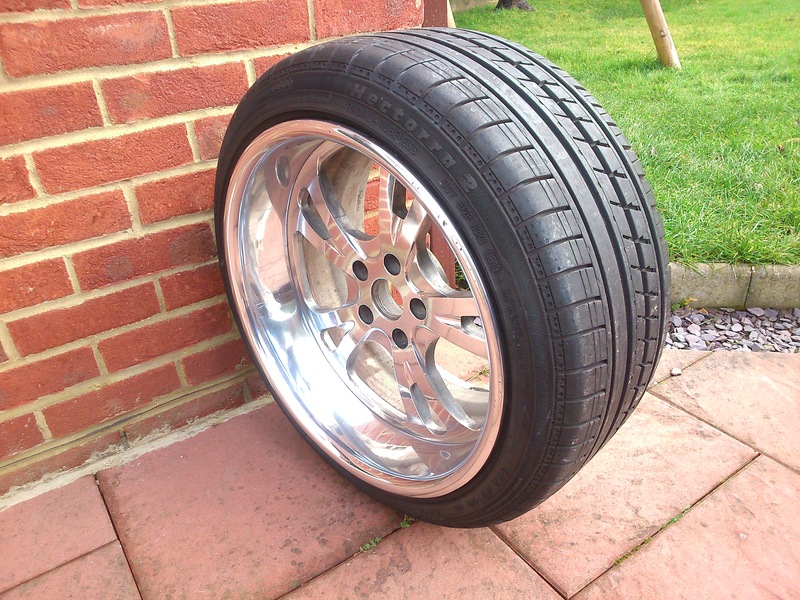 First order was to get the Origin style, +50mm, rear over fenders on.. 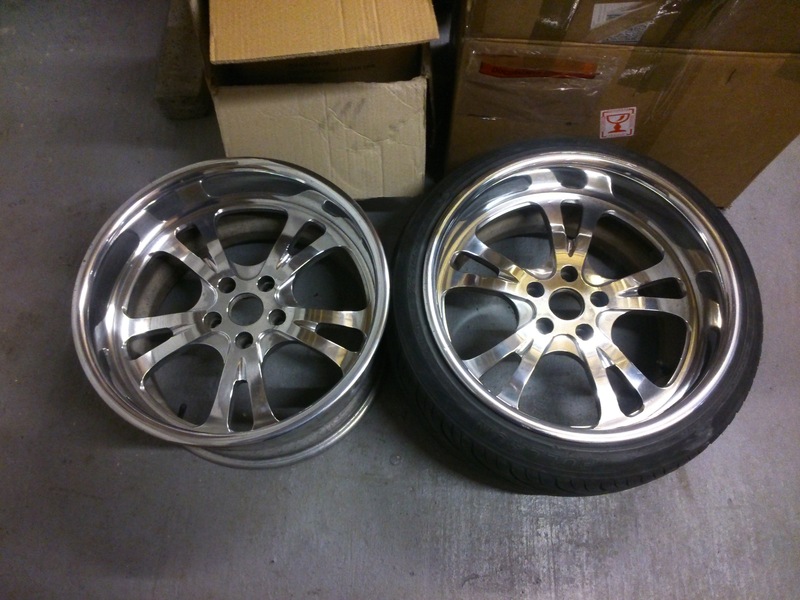 I got these from EP Racing through the gtr.co.uk forum. On first offering up the arches didn’t fit too bad for copies and were certainly decent enough quality. They would need a little tweak to get them nice and tight on the panel for sure but nothing a bit of fettling some fasteners couldn’t sort out. 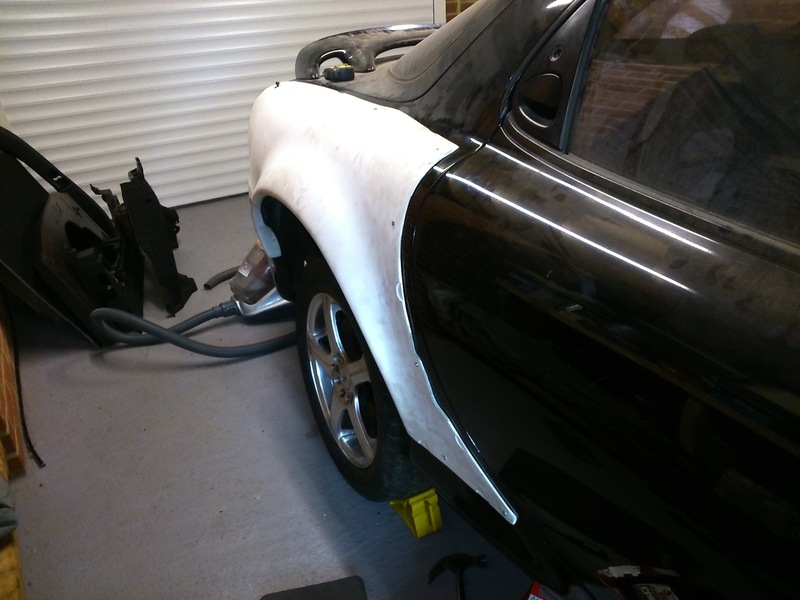 I was not keen on cutting out the stock rear arch completely so I took the decision, for now, to get an arch roller and go t town rolling the rear out as much as I could. With the lip rolled out as much as I could with the roller some final tweaks were made the with a large hammer to get the lip as wide as possible. 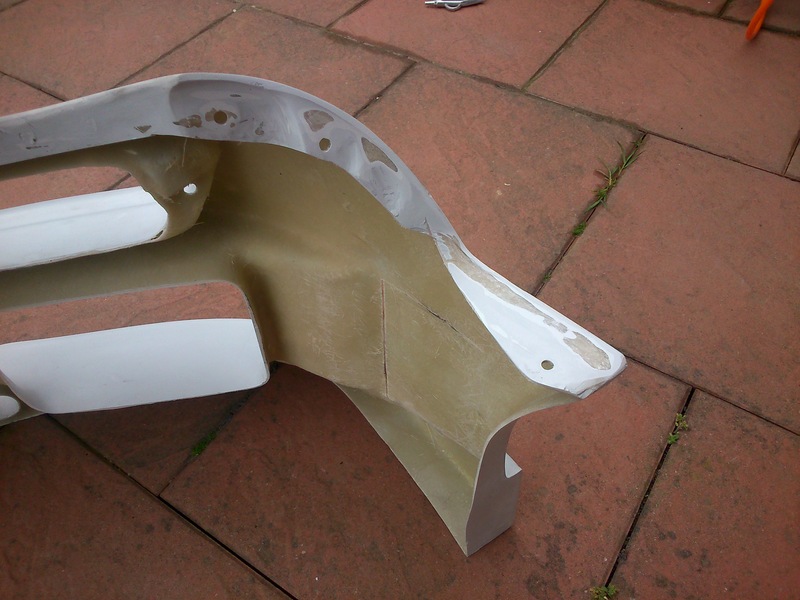 I then set about fitting the rear quarters and trimming and relieving the mating surface as necessary to get as even and flush a fit as I could. I used self tapping screws around the periphery to retain the arch in position which took a reasonable amount of force in a couple of place due to the panel trying to pull away from the car. All manageable though. The end result was a nice snug fit though. The last part of the prep work needed before I was ready to bond the arches on was to mark out the arch outline and the grind the paint off locally to give a nicely prepared bond area. Seems harsh taking a grinder to the otherwise nice paintwork but needs must! I had everything prepped and ready to go. I purchased some suitable 2 part glue that was recommended by one of the suppliers we use at work. It required a 1:1 ratio dual cartridge gun which was a bit of a pain as they are not cheap to buy. 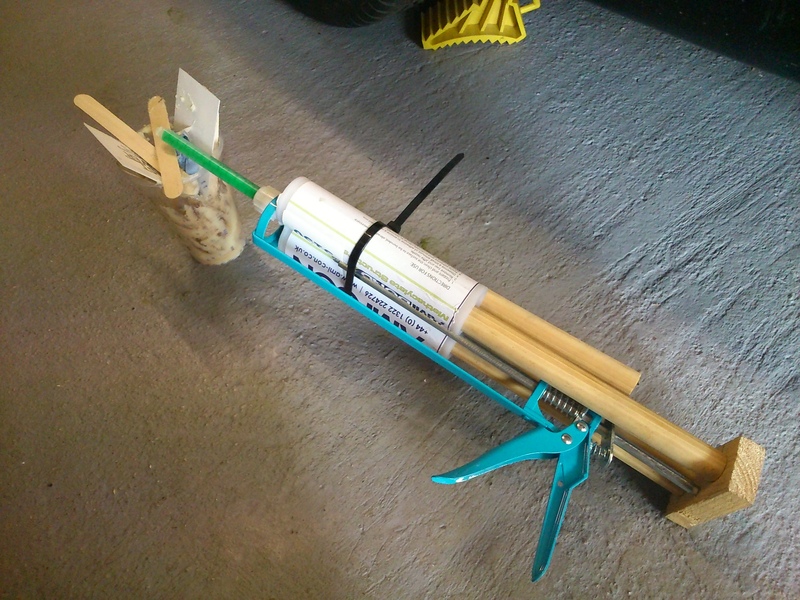 So I decided to knock up my own one using a standard single cartridge gun an old broom handle and block of wood! Now that is proper engineering!! With that ready to roll I made sure the arches were cleaned and prepped and ready to go. The glue I was using had a working time of about 30mins at RT and with the warm weather it would go off even quicker. So I was going to have to move fast to get the glue spread and and arch positioned and secured before it started to go. Feeling a little nervous I quickly ran a bead of glue around the bond line and spread it out to cover the bare metal. I then ran around two more beads which I left as they were so they would squeeze out naturally over the bond area. It was a bit tricky finding some of the screw holes with the glue squeezing out everywhere but I got there in the end and managed to get the panels on before it was too late. Once I had got the panels on and secured I ran around the edge and anywhere I could inside to back fill and gaps and make sure there was a full spread of glue. A bit messy but it will all be clean up when it gets blended in! The final sticky mess looked something like this! With the sticking all done the next job was to start the blending. First step was to run around cleaning the excess glue. I then went around the edge beveling it off and thinning it out over a narrow area to hopefully minimise the tendancy to crack down the road due to flex and expansion etc. It would also reduce the step I needed to blend in. 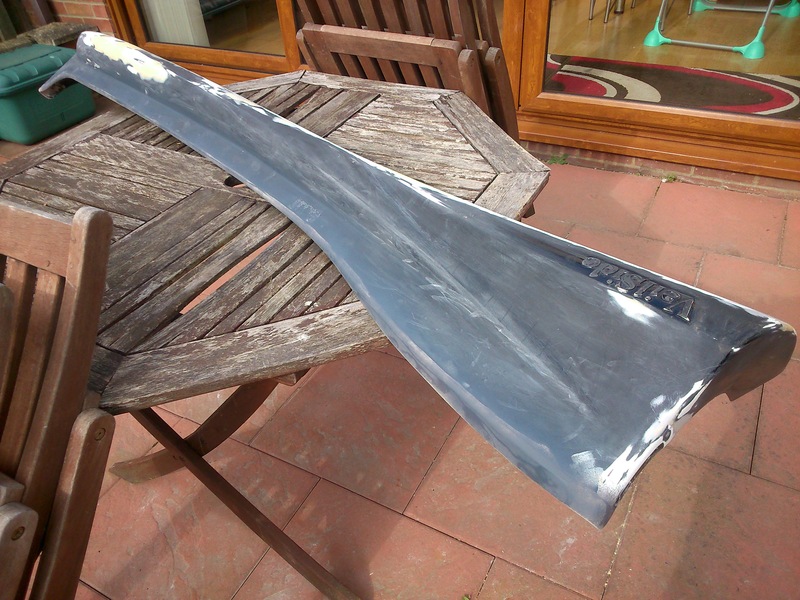 First step was to finish the blend with some chop strand glass fibre filler the P40 stuff. Next step was knock the top off the glass filler to take off any real high spots and smooth over and start creating a wider blend area onto the main panel using regular easy sand or P38 body filler. All the initial shaping at this stage was done with a course 80 grit and rigid long board. After a couple of goes at this I felt I had enough of a base on to then go with a finer topping filler. I use Top Stop Gold. Really you only want this as a final skim it is not for building up any thickness. Also when it comes to flatting this back I use a guide coat of primer or suitable dark paint to help show up the low spots that are left. In the end this part of the process took me a lot of time as I kept finding slight low spots and not wanting to leave areas of glass fiber panel with raw glass exposed. I used various long boards and large flat block to try and avoid creating local flat spots myself. Main rubbing down was done with a 120grit to get the shape and then a final flat with 240 grit was done before applying primer. After this a couple more coats of Top Stop were applied to take out the last few low spots I could feel and cover over the exposed glass fibre areas. 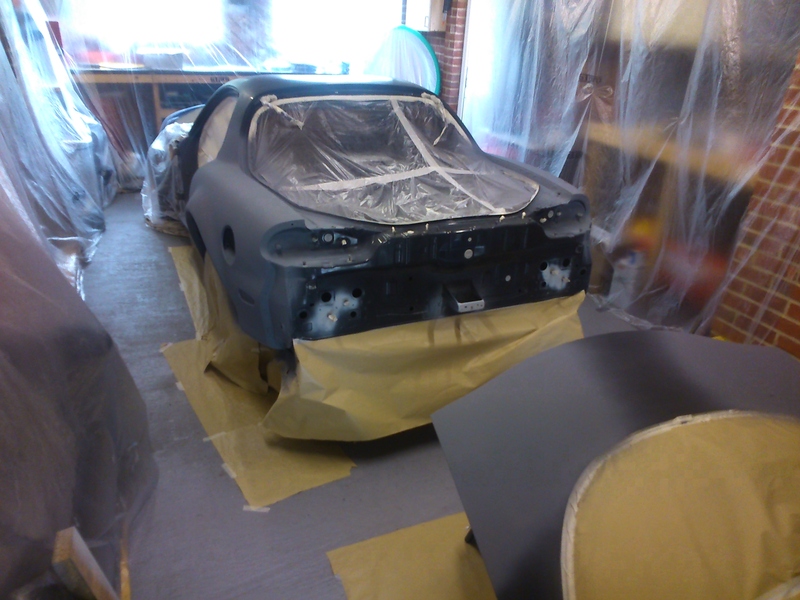 An initial coat of high build 2K primer was then applied using a roller. 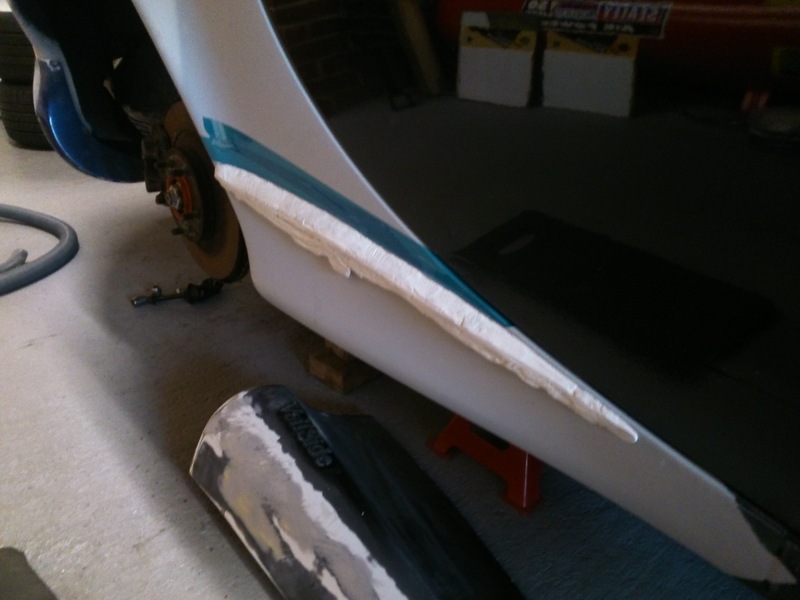 While I was in between filling and flatting the rear there were repairs that I needed to carry out on my front arches too so I worked these in between and rolled some filler on at the same time too. 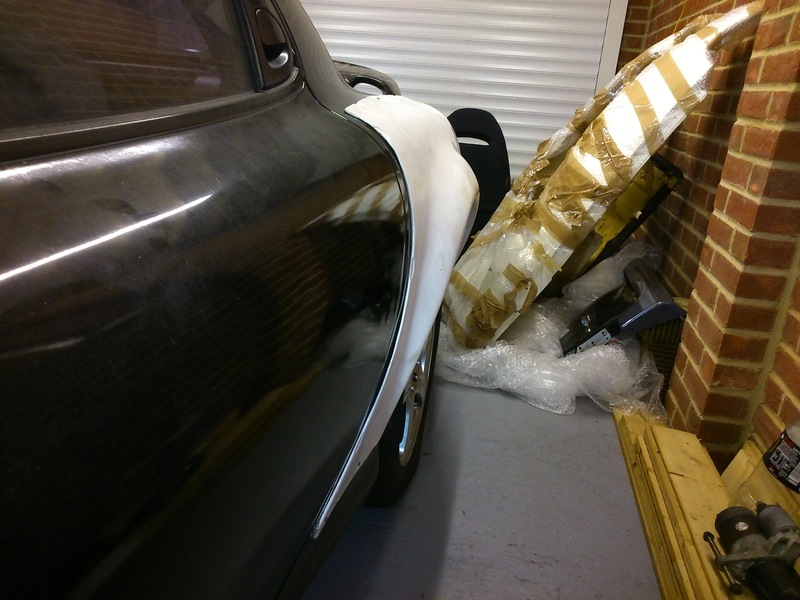 I have had a number of thoughts about how to finish off the rear end of the car. 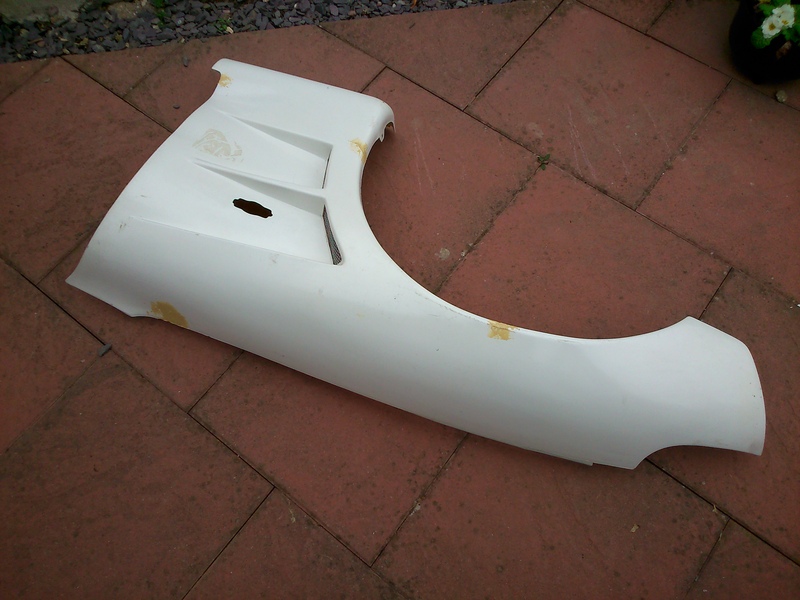 I have a number of bits including some Veilside Spats and an RE-Amemiya replica rear light cover. 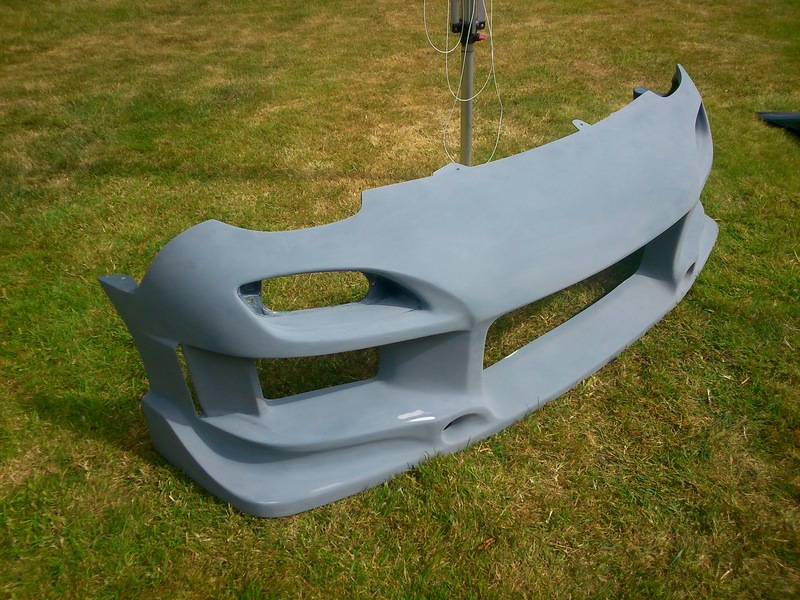 I then stumbled across a rear bumper that kind of wrapped all this up into one and also gave me a unique (well pretty rare) rear end look. 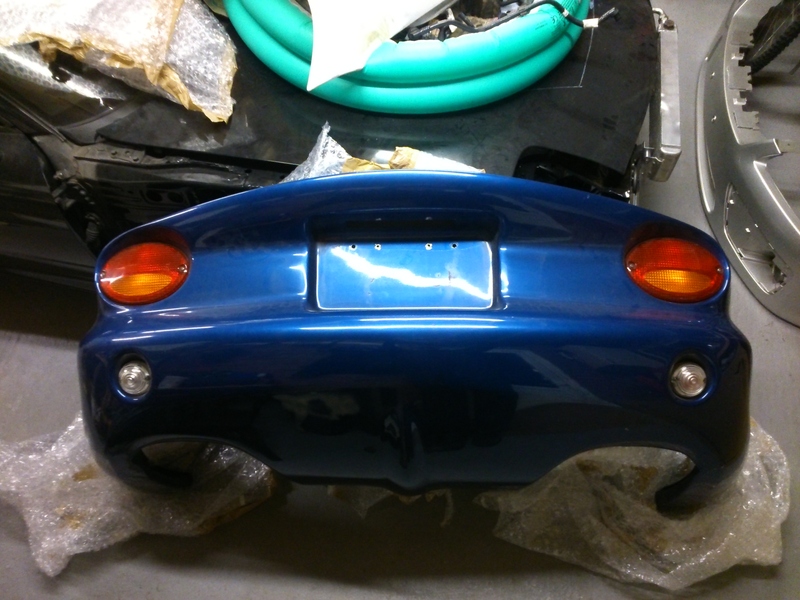 An RE-Amemiya AC978 rear bumper. Initial fit looks pretty good but I will get around to fitting this properly soon and doing any blending work that might be needed. After a few weekends of bad weather slowing progress as I wanted to do some heavy rubbing down outside, I decided to take the opportunity to polish up a couple of my wheels. 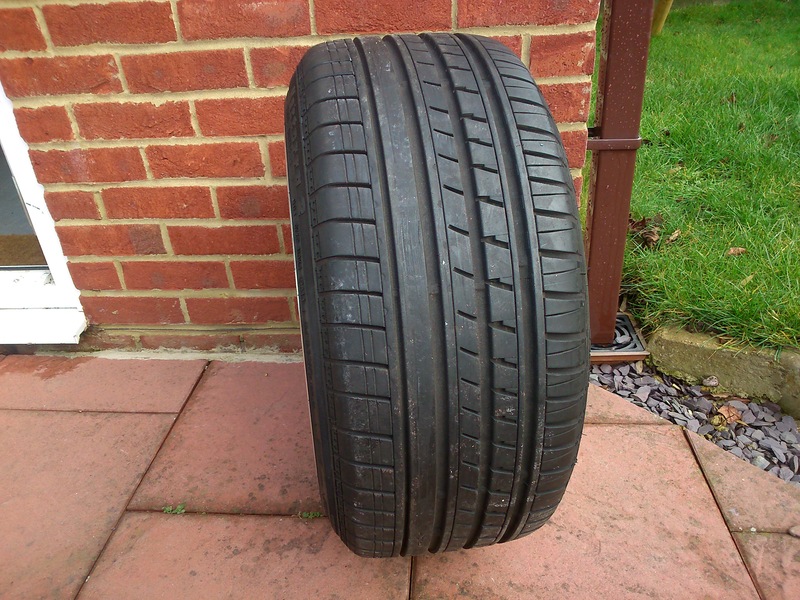 I also wanted to get some appropriate sized tyres fitted to these so I could check the fit ans sizing of them properly and try and work out what offset I can run in the event I get some new wheels! 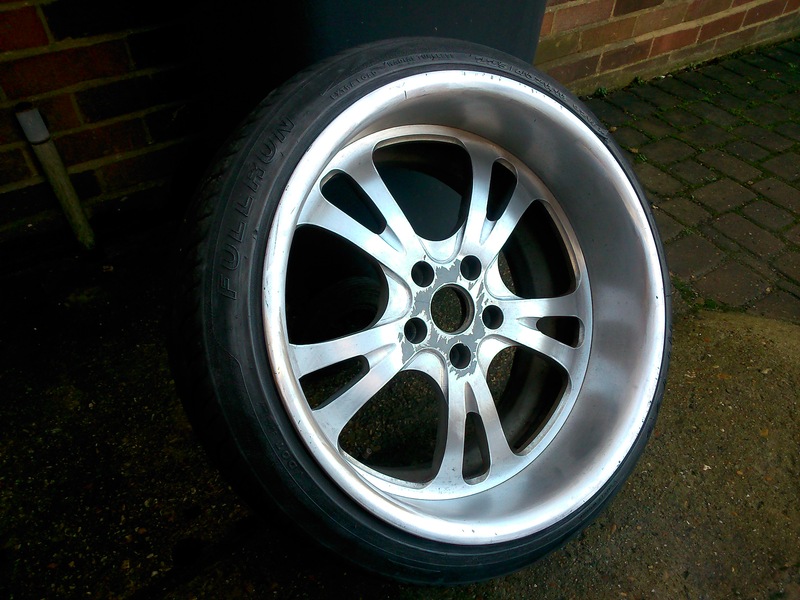 I used some proper buffing wheels to give the wheels a coarse polish and then fine grade polish. 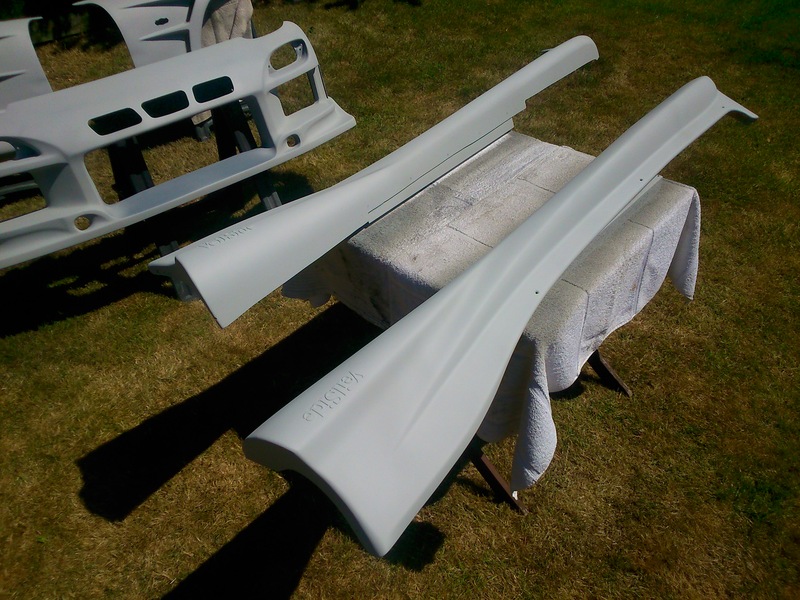 After that I used autoglym to finish them off. The result was pretty pleasing. There is still some minor pitting in the rims if you look really close and some deeper kerb marks that I could not remove without taking away too much metal. All in all not bad though considering how they started off! Once I was happy no more polishing was required I sorted some tyres and got them fitted up ready to try them on the car. 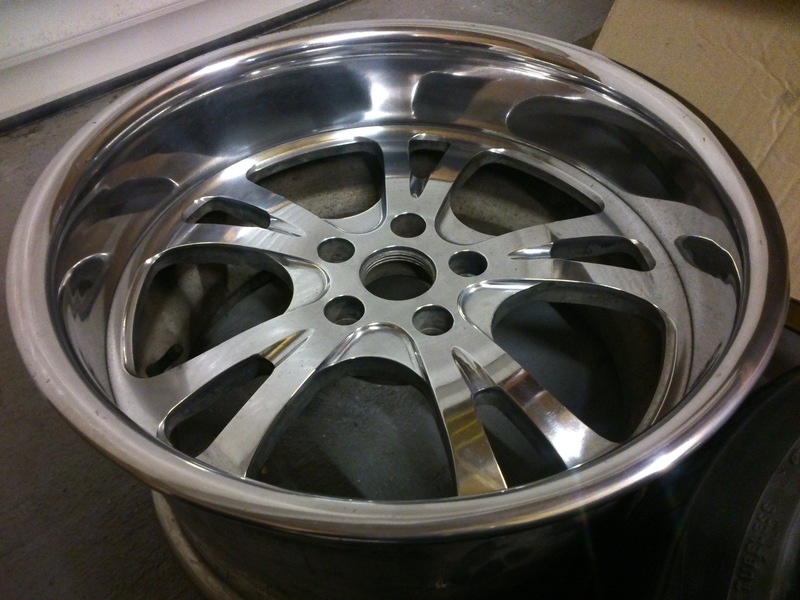 The pair I polished up first are 10″ wide with ET10 offset. I opted for 245/40/18 tyres to get a bit of a stretched look and help with arch clearance for the front. I certainly wouldn’t want any more stretch but I think they will look nice when fitted.. bearing in mind this size is actually what I will be running up front! I will finish off the other pair in time but as these are only 8″ wide unless I can widen them I won’t be using them in the long term. 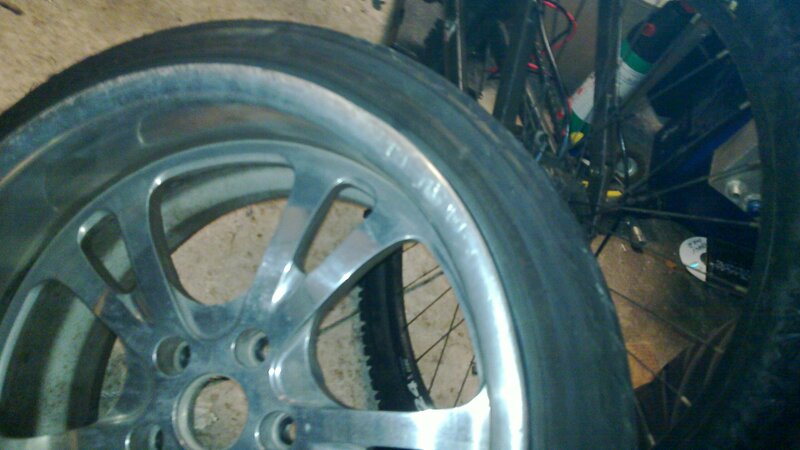 As you might remember one of these rims was pretty badly damaged at the start. After all the repair work. when I fitted the tyre and got it balanced it only took 10grams and there is only a very slight flat noticeable in the lip of the rim. No buckle at all. That was very pleasing. 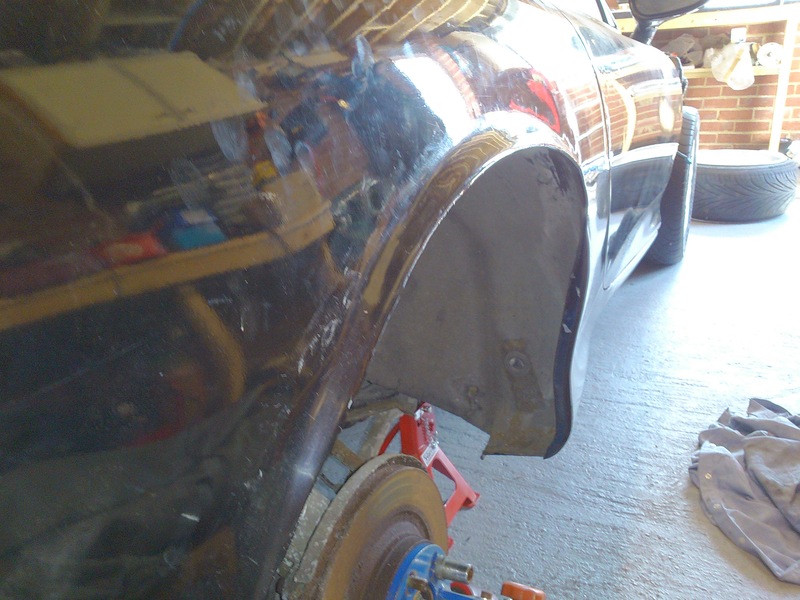 When I fitted my rear over fenders you will recall that I rolled the original arches to avoid cutting them. It is something I was not 100% sure of at the time and has been playing on my mind. Finally it beat me and I decided the only thing for it was to cut the original body work and bend it out to meet the new over fenders. This way I could be happy I could maximise the tyre and wheel combination I could run on the rear without worrying about it rubbing. 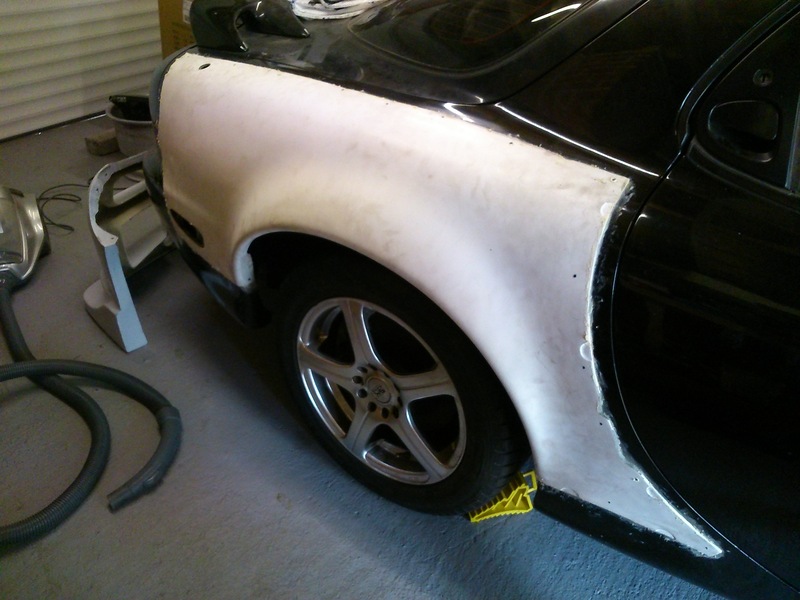 First step was to cut the original body work to allow it to be straightened out to meet the new over fenders. I decided in order to do this properly I wanted to make sure it was all water tight after cutting and moving it into position. So I decided I would fill up the gaps with expanding foam which I could then shape back and coat over with fibre glass to give a nice solid joint between the two skins. 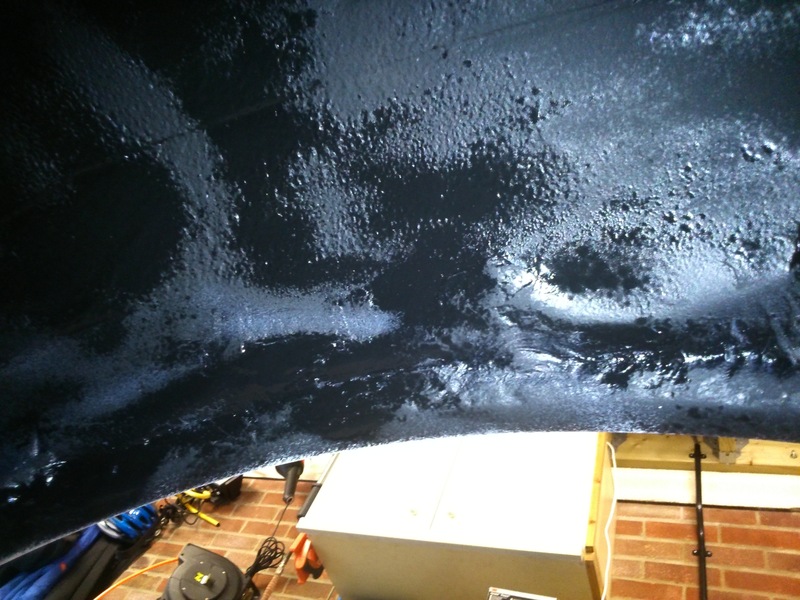 After blending over with fibreglass and cover the last of the cuts in the bodywork, I gave the inside of the arch a squirt of stone chip and it was looking just like new! 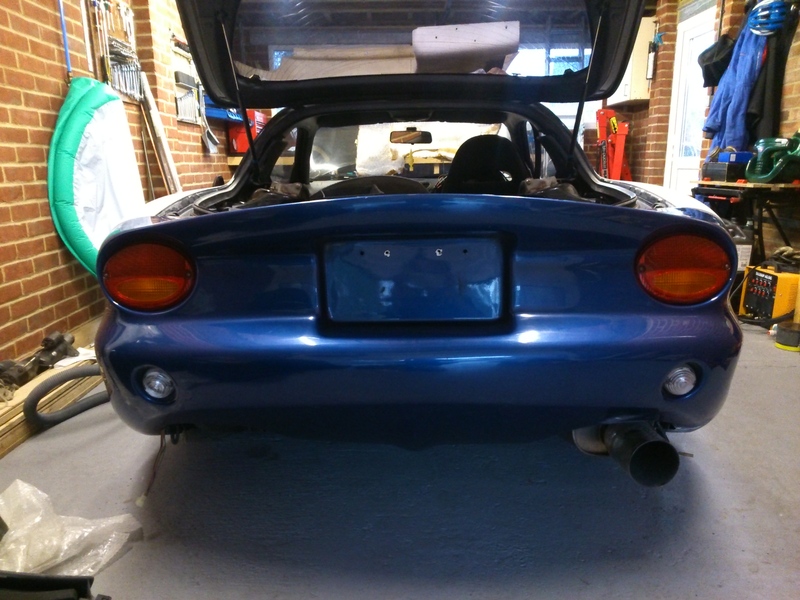 The initial fit of my rear bumper looked pretty good but there were a few gaps where the overfenders held it off slightly and there was a reasonable step between the rear quarter and bumper. I decided I could tweak the bumper to resolve this. So set about trimming it where necessary. 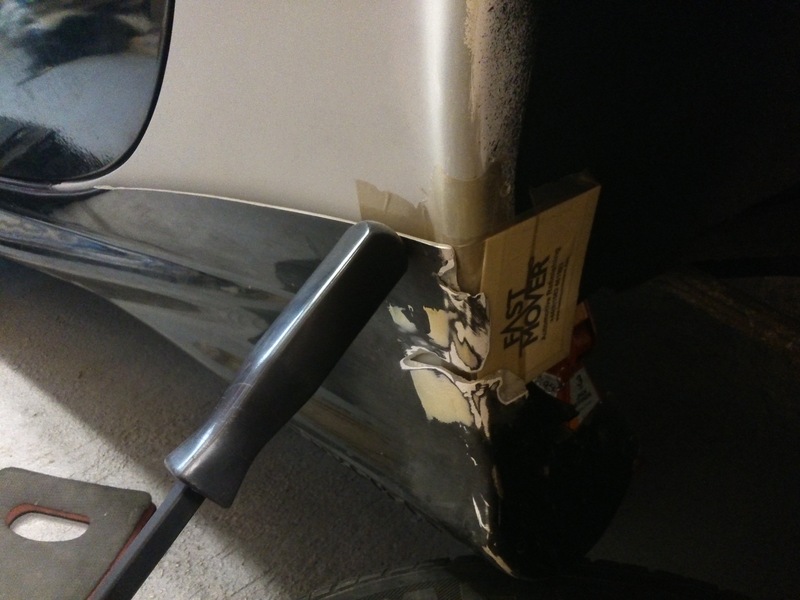 I then used flashed tape on the rear quarters with a bit of wax to prevent sticking. 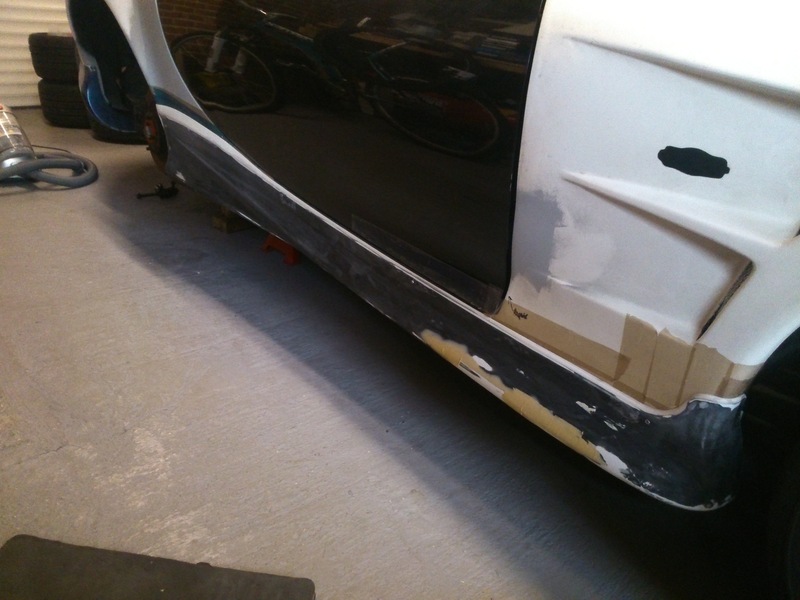 With the rear bumper fitted in place I then blended out the step with body filler to bring the two section level. I did the same along the sides to remove the slight gaps. 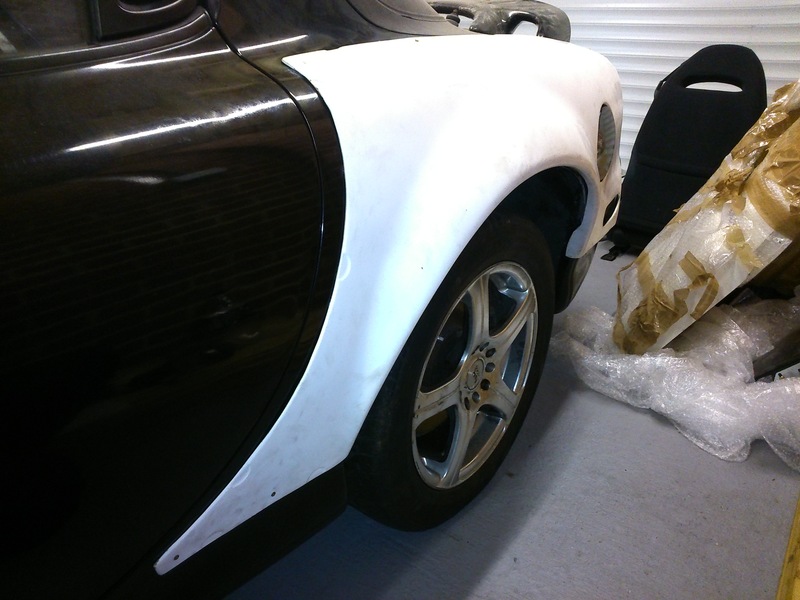 This job was certainly not as painful as blending the rear quarters themselves! 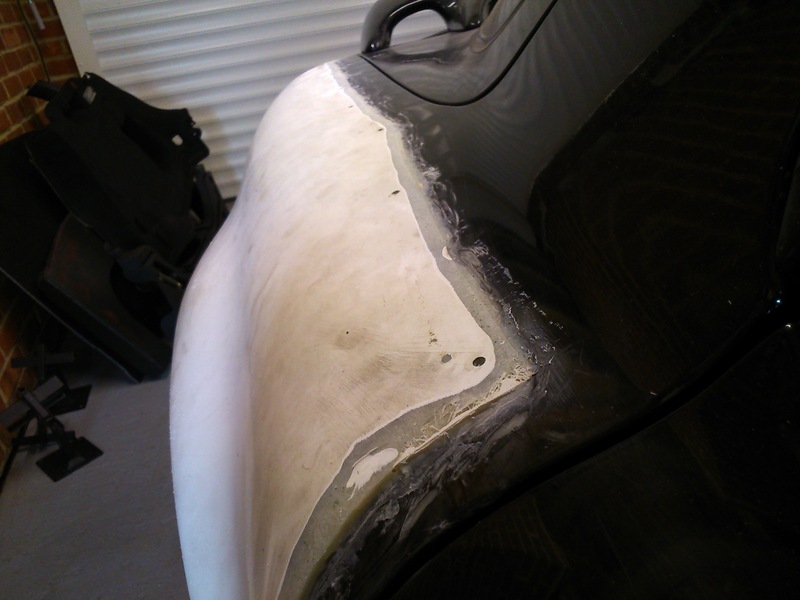 The result was a much smoother blend between the two and nice snug fit along the sides of the bumper to the rear quarter. 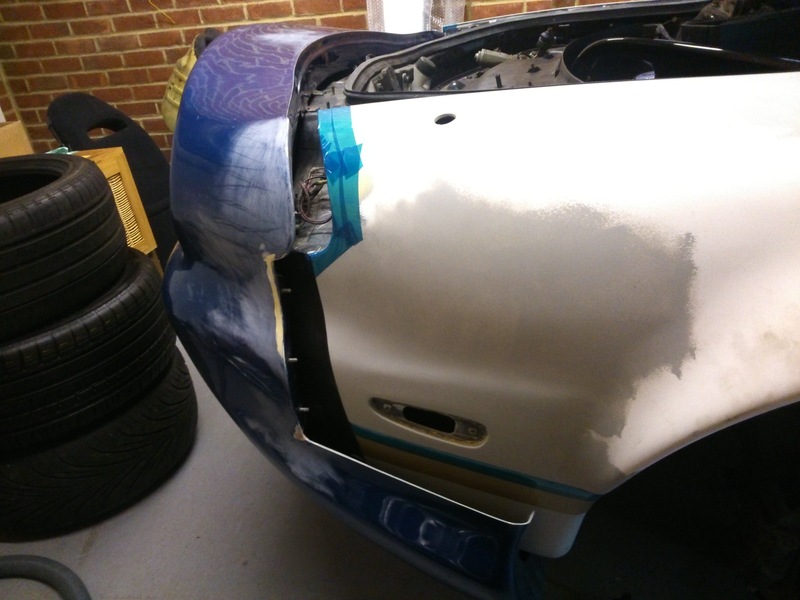 I also took the opportunity to carry out all the small repairs on the bumper and add some fixing points in the rear of the car to support it better. 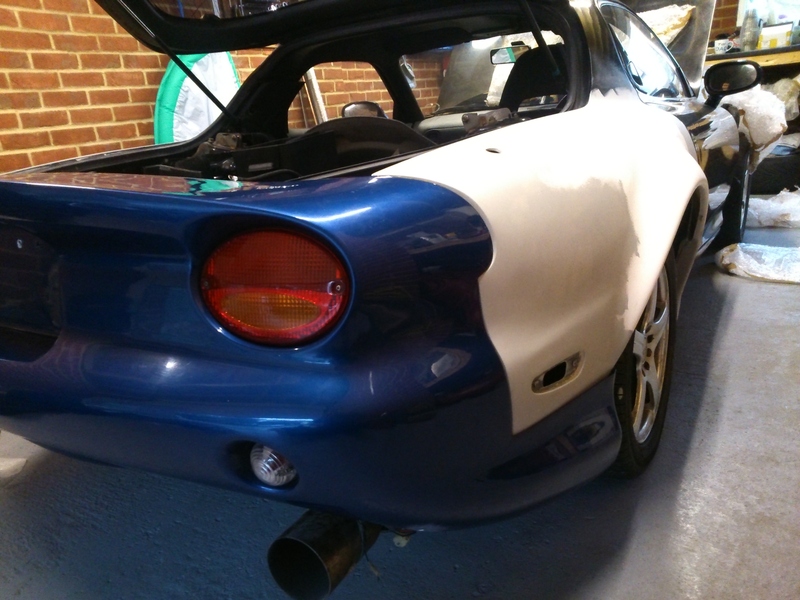 The rear of the car was looking pretty good now as far as I was concerned so I thought it was time to move on to the side skirts which needed some serious attention! Amongst my collection I had some genuine Veilside skirts which I had bought for the last RX7 and never used. 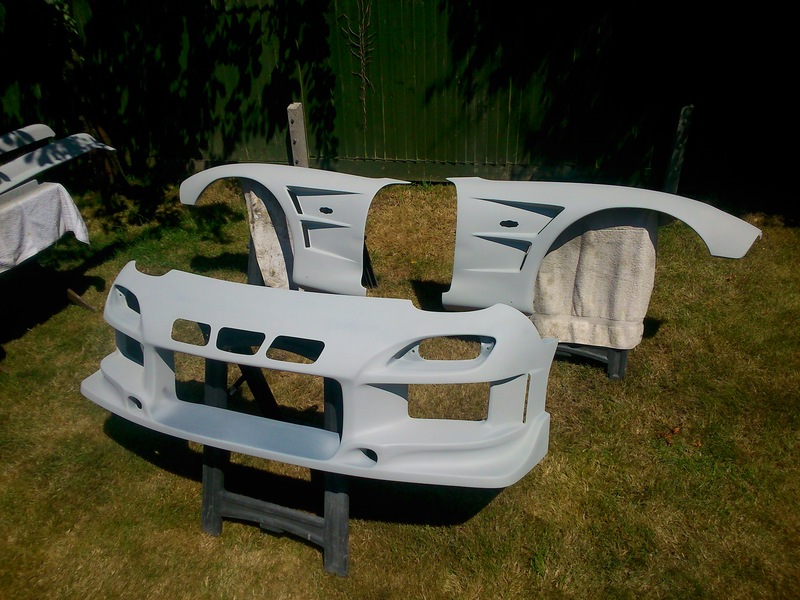 These looked like they would suit the rear bumper shaping the best. The other skirts I had were squarer in profile and I wasn’t sure they went. 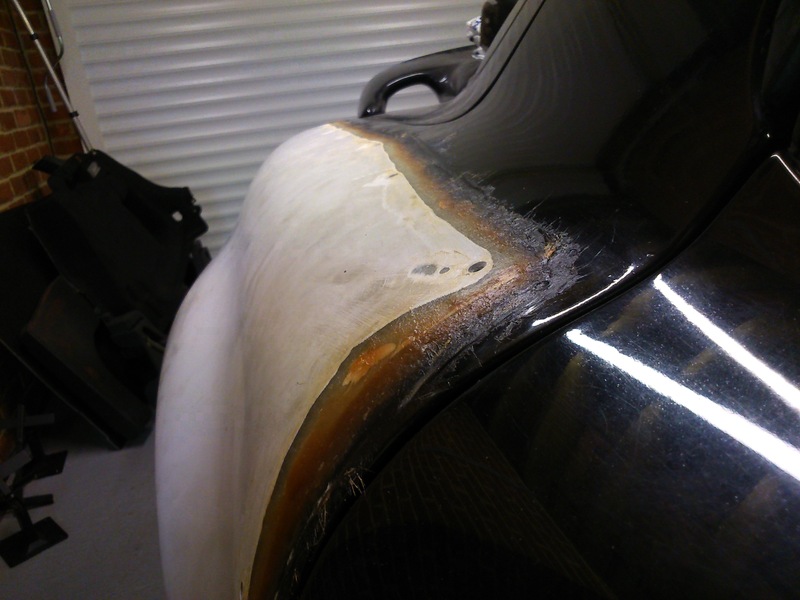 The Veilside ones did however need a lot of work as they had been previously damaged and then repaired pretty poorly. So I set about removing the old repairs and re-doing them. At one point the Passenger side skirt was nearly completely snapped in half and a big section of the lip that attaches it to the lip of the rear wheelarch was completely missing. 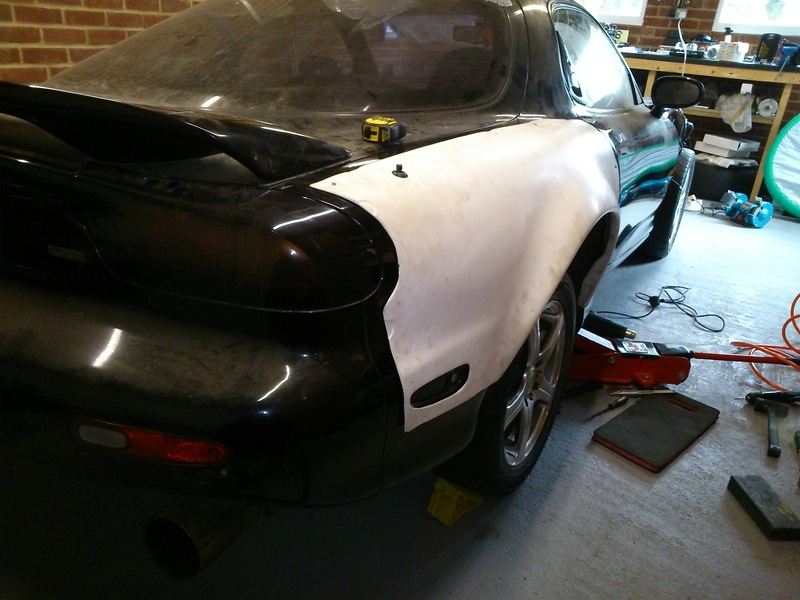 To build that back up I positioned the skirt on the car with PTFE tape behind it and a filler spreader to give me some excess area to mould on. 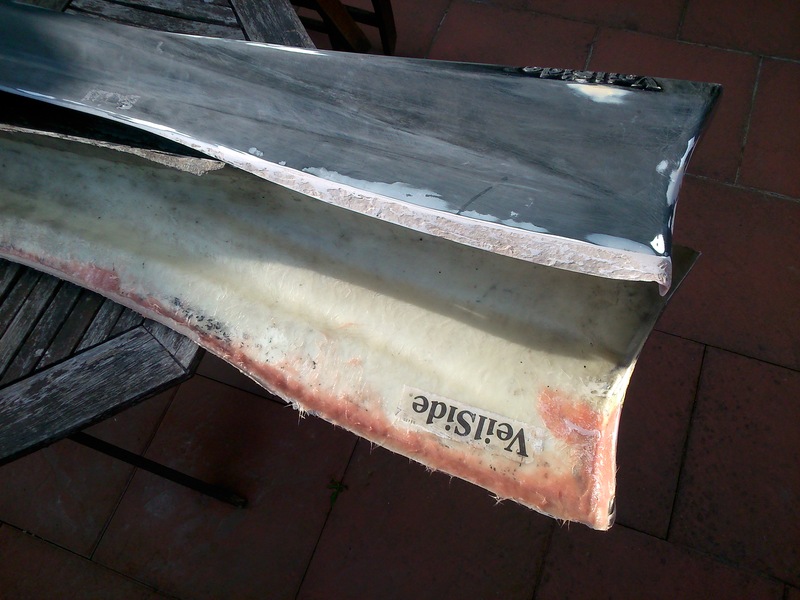 Out with the fibre glass and hey presto! 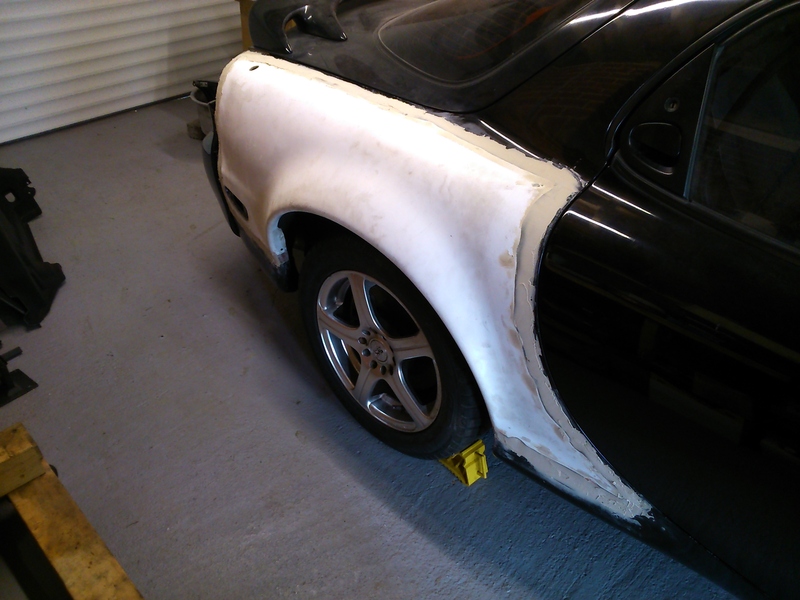 In order to get the Veilside skirts to blend properly with the Origin rear over fenders it was clear I was going to have to modify them. I must say I was quite nervous about cutting them even though they were in a bit of a mess to start with! They were still genuine parts! After much deliberating I took some measurements and made the cuts. 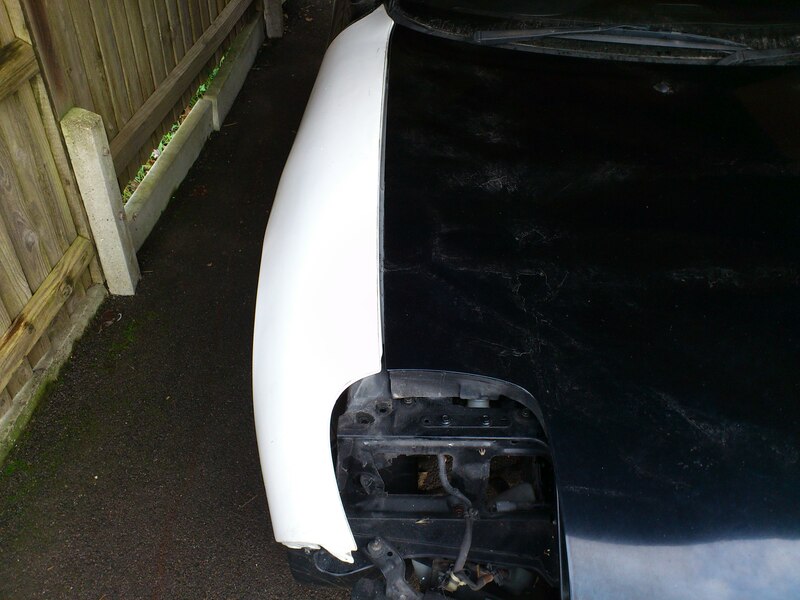 Now the fun would begin as I had to somehow create a blend back to the bodywork. I will show you how when I figure this out myself! Blending the skirts to the main body turned out to be quite a long winded job! One of those things you regret starting! but as wise man once said. ‘I have started, so I will finish’! This will be the very much cut down version as I spent a good few weekends doing the work. 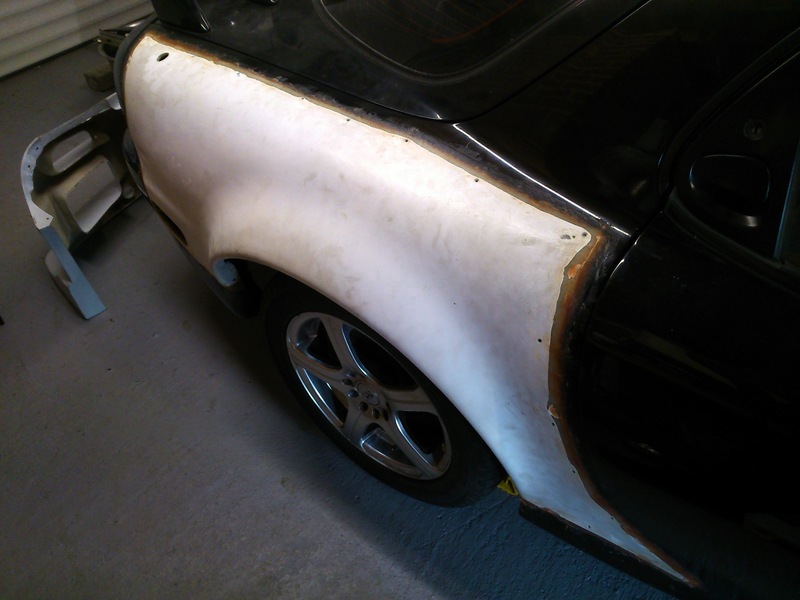 First of all was get an idea in my head as to how I could get a blend to fill the roughly 10mm wide gap back to the body work along the rear edge of the skirts where the arched started to flare out. Check. Next was think how I could bridge the gap to mould the shape. short of packing it full of loads of glass fibre paste. The cunning plan I came up with there was Plasticine. Clay could have worked equally well. The good thing with the Plasticine was I was able to form this too a shape and add to it and reshape it until I was happy with what I saw. Once I had the shape I covered over the Plasticine with PTFE tape to prevent sticking, wedged the skirt back in place and built up a layer of reinforced filler over it. While I was at it I thought I would just run tape the full length of the car and take up any of the other gaps that where there! There were a few oddly trimmed bits along the way and the front edge also had a slight gap down to the after market wide front fenders I think. but nothing a bit of filler and graft couldn’t sort out. With the first stage of the filling done the new edge of the skirt was quite delicate. 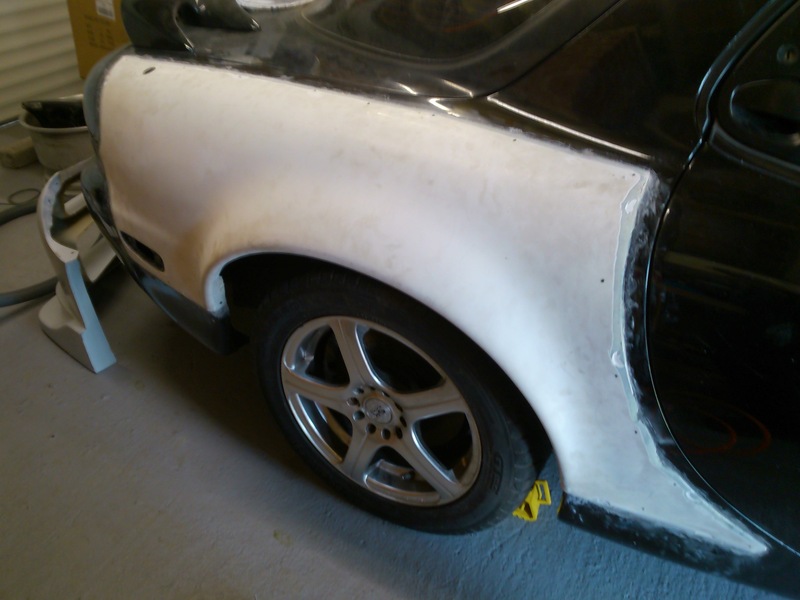 So to reinforce it I back filled inside the skirt with glass fibre paste. 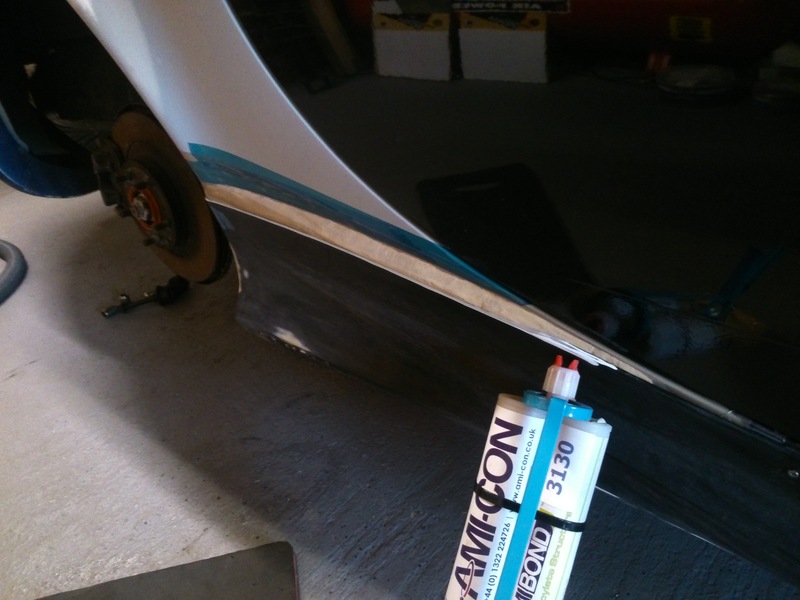 I also used this to create some nice thick flat areas to help when it comes to attaching the skirts to the car in the end. Once this was all set it was time for the painful job of building up the outside surface with some easy sand filler and then sanding it back to a nice, smooth, final shape. it seemed to take forever but the final result looks like it will work. Proof will be when it is all in colour and fitted! 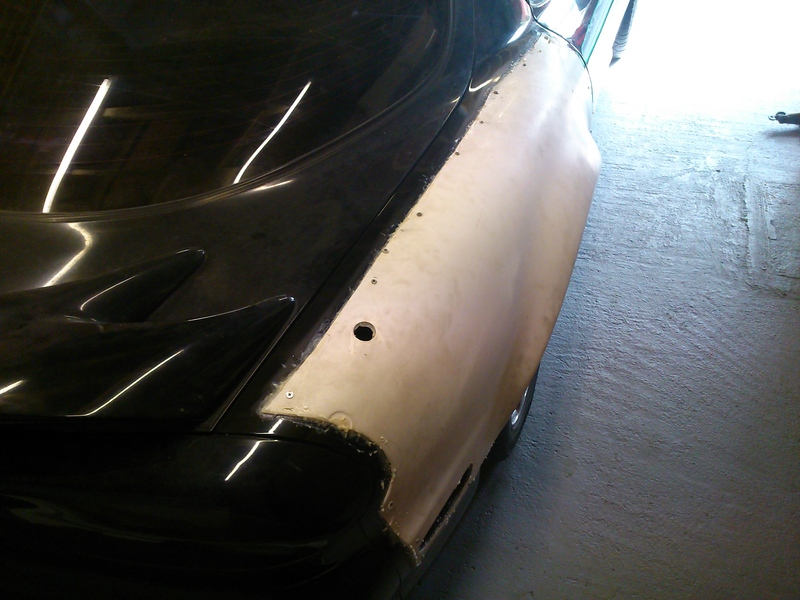 It was now time to move up front to the next piece of bodywork! 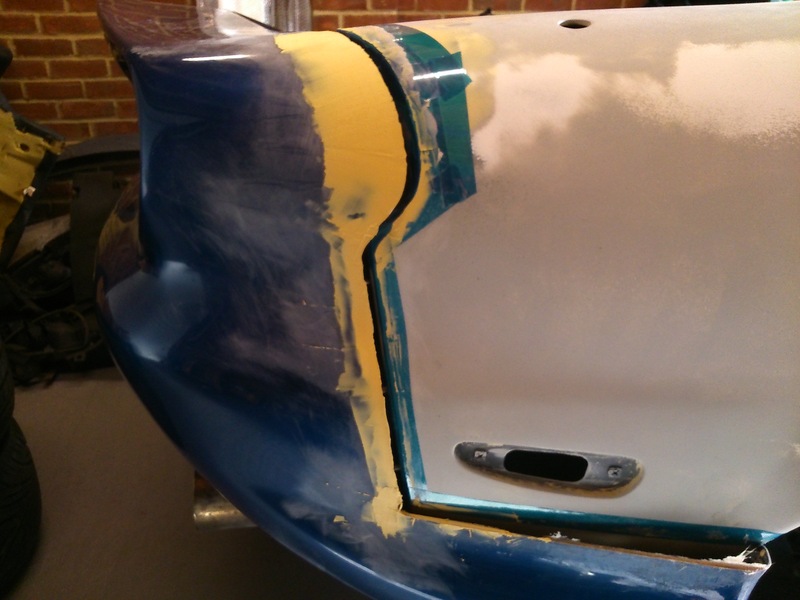 The front of the car had been test fitted way back at the start of the project and I knew would need some fine tuning on the bumper as it was not a great moulding. I had seen worse fits but was looking for something much better. Plus I was going to have to add some ventilation mods to feed air to my oil cooler. As I started to fit the bumper for the first time since having all the oil cooler and intercooler mounted it was clear to see there was a bit of a clash issue. Not sure how I missed this before but I had! So I thought about how to get around it and decided I needed to modify the oil cooler bracket to drop it and push it as far back as I could. Modify the top hose part of the radiator to allow the above to work to the fullest extent. I would also need to cut the corners of the intercoolers to gain bumper clearance and to make double sure this was the case and also help with air flow for the coolers I would cut some vents in the side flanks of the bumper too! So first of all I marked out an cut the bumper. 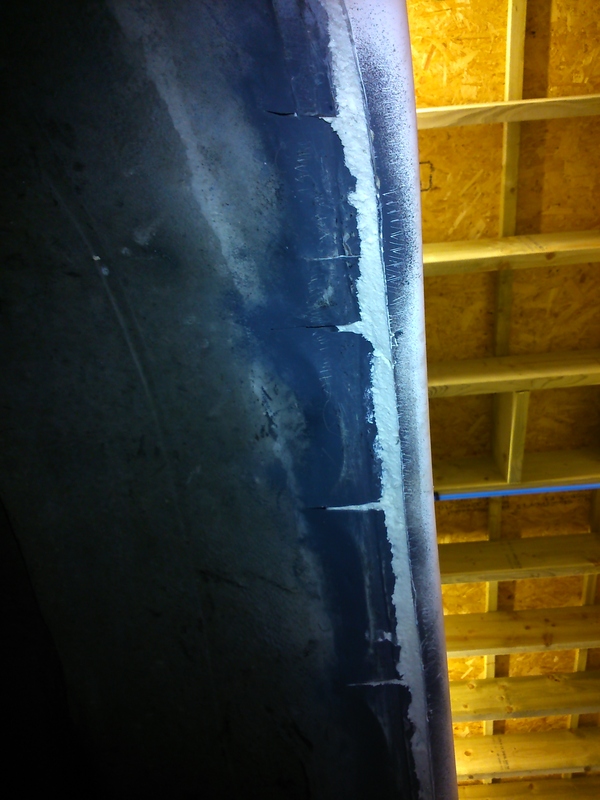 The resulting flaps were then bent open using a hot air gun to soften the glass fibre moulding. I then used the Plasticine trick to bridge the gap and mould a vent shape. I also set about tweaking the fit of the bumper to the wings. 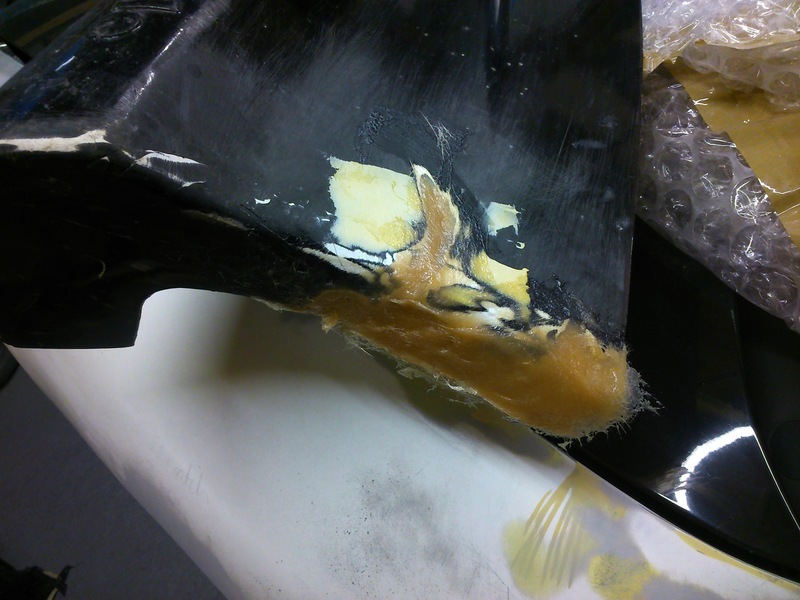 This involved quite a bit of careful fettling to create the female version of the end of the wing in the mounting face of the bumper. 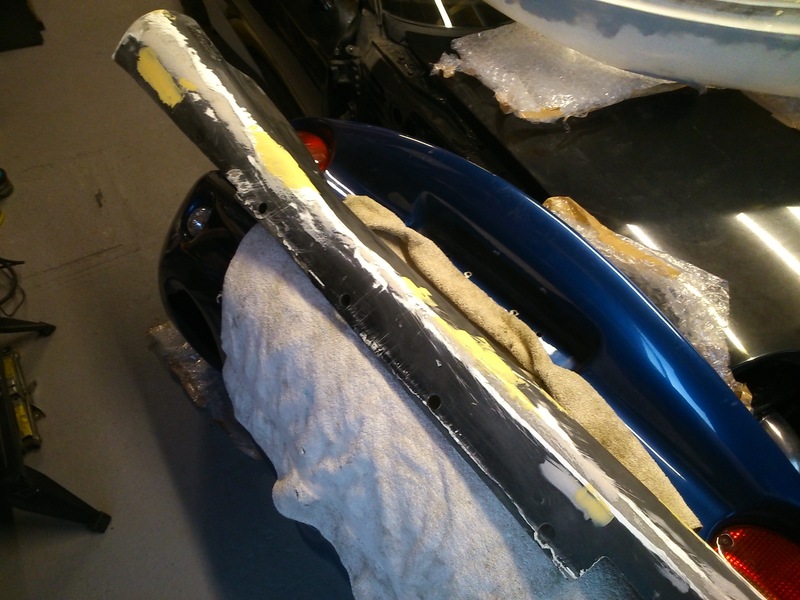 Once I had done as much as I could I covered the end of the wings in PTFE tape so I could filler squeeze the bumper in place to get a nice matched mating face between them and then blended the two parts together to create a smooth a transition as I could from one panel to the next. 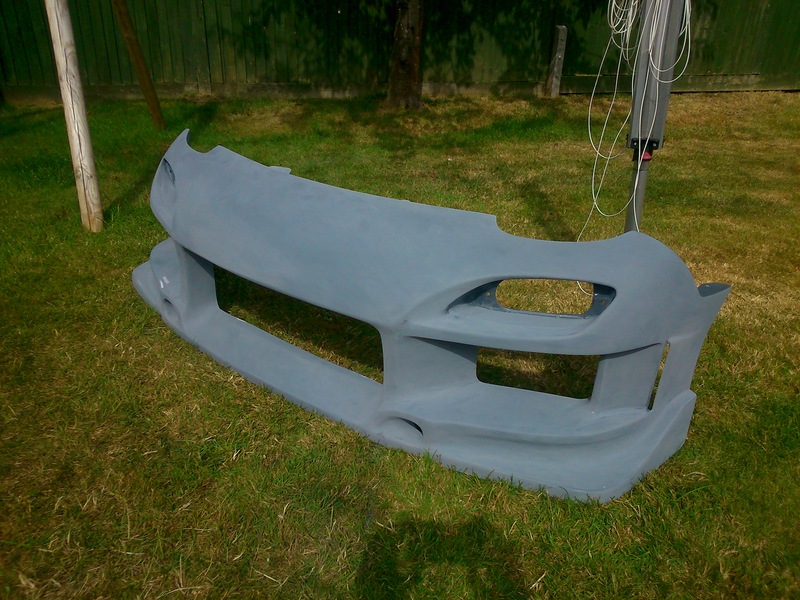 The last part on the bumper was smoothing out all the modified areas and mainly the top front face of it which has a lot of undulations that I was not happy about. A lot of filling and sanding back required there. On top of finding blow holes in the gel coat all over the place and voids in the backing giving rise to air bubbles which needed digging out and repairing! Hope it is worth it in the end?! I mentioned the fitting of the bumper above required some tweaks to the intercooler and Oil cooler set-up. Until now I had been farming out my ally welding to someone else as I only had a DC welder. I decided this was getting silly and it was time to buy myself an AC/DC welder so I could start doing my own ally work. I only got a cheap one as I could not warrant the cost of a well known branded one. Hopefully it won’t die on me! Anyone who has tried ally welding will appreciate how big a jump it is from doing steel! I did not fully appreciate this. It is not a case of switch on to AC and start welding as if you are doing steel! After being at pretty much a total loss I found a great forum with a really helpful bunch of guys that I cannot thank enough. The forum is http://www.mig-welding.co.uk Don’t let the title fool you! Covers all kinds of welding. Anyway. This got me going with a few test pieces. 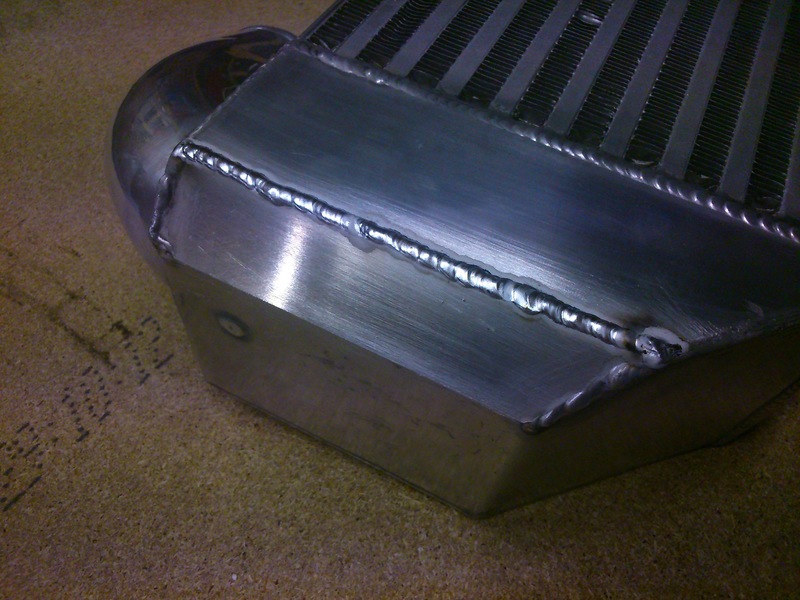 But being that I had to crack on in the end one of the intercoolers had to become my guinea pig! So out came the saw and I cut a nice neat 45deg angle on the end of each cooler. This should give me a good 10mm extra clearance to the bumper. With a suitable shaped plate cut to cover the hole I then said a quiet prayer and let rip with the welder! I dipped the tungsten a couple of times but other than that and my slight lack of ability to go in perfect straight lines I was quite pleased with the repair job. It will do the job, at least and is hidden away behind the bumper out of sight! 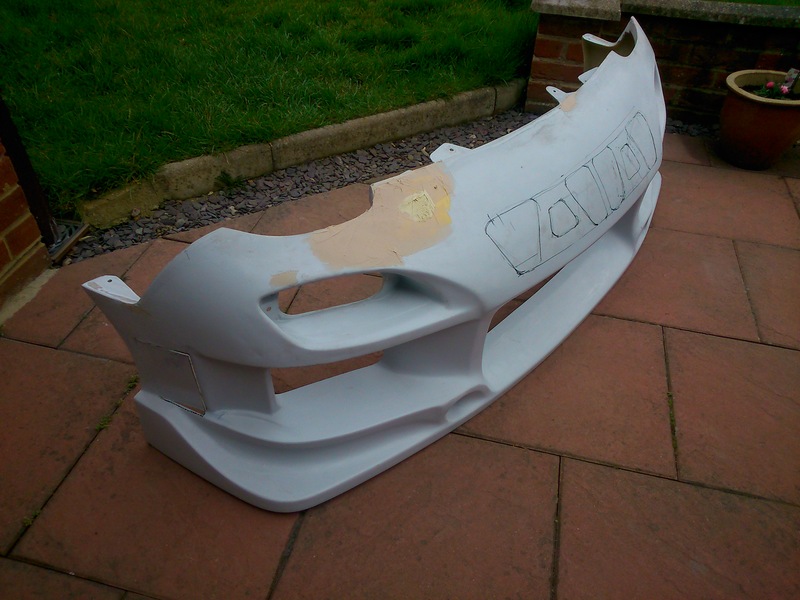 At last the bodywork was starting to take shape. I had kind of been putting it off in some ways. As they say everything is in the preparation and I had a hell of a lot of that to do to get to a final finish. So I know it will seem like weeks of no progress before (hopefully) It suddenly takes on some shape! 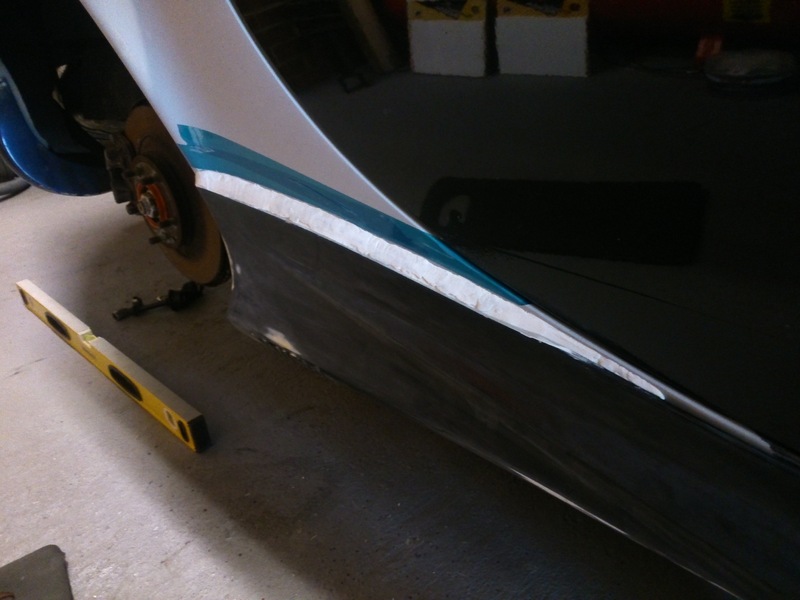 So I had been tweaking my side skirts last time and trying to get the bumper looking sensible. Last real job to do on the side skirts was add some angle section to them. There was some moulded in originally but it was a bit mashed up and messy so I thought rather than repair it I would replace it with a nice strip of angle ally. The strip just serves as somewhere to hook up under the sill of the car. it will stop it flapping about in the breeze when it is finally fitted! I secured this in place with some special composite glue and a couple of rivets for good measure. I must confess to calling in a bit of help with the bumper. Doesn’t happen often but I was aware I was spending a lot of time on it to try and get it right and this was not something I could really afford. So I got a painter friend to give it a final flat and some high build primer for me to get me back on the right path. It came back looking much better. Just the fact it was one colour now helped! I ended up touching in a couple of sunken areas outside of the original filled area but hopefully it should look respectably once it reaches gloss! Now all I was left to do with this was cut in some vent holes to feed air to my oil cooler! Many patterns and ideas crossed my mind but I decided to stick with something nice and simple. I think that front end is going to look pretty mean when it’s all done. I certainly hope so anyway! With all the filling and mods done as far as I could tell it was time to commit to putting some paint to panels! 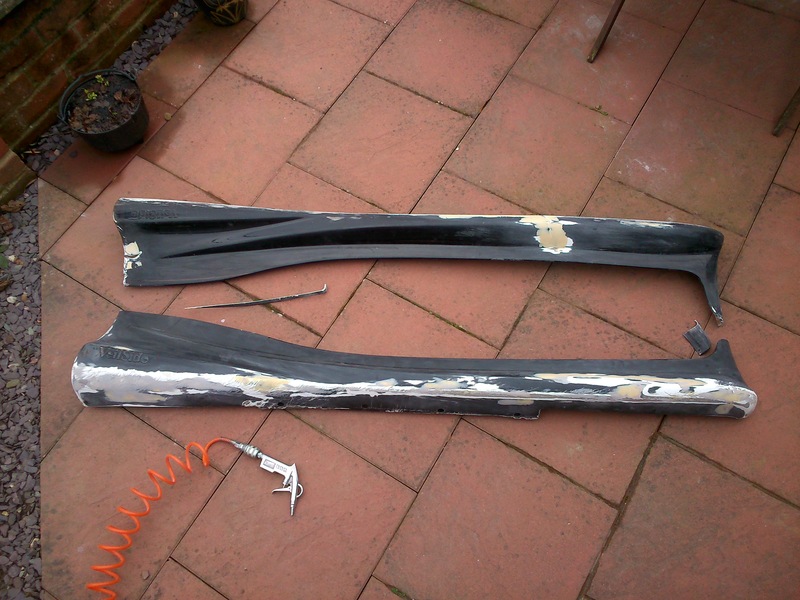 I started with all the fibre glass bits. I would move on to prep of the main body work next! Luckily the weather was being kind to us at present so I was able to get outside and do this. Saves filling the garage with spray dust at least! The coat of primer on the wings highlighted a couple of blemishes I needed to take care of but I envisaged they might need a couple of coats being fresh panel anyway. So until next time I have plenty of prep work to get underway and a bonnet to finish modifying! It has been a little while since I updated. Mainly as I have been too busy. Winter 2015 is now setting in and I am not where I had hoped to be. When it came to putting colour down I ran into some issues and had a complete nightmare! So lets start where I left off. I will mainly let pictures do the talking otherwise I will be here forever! 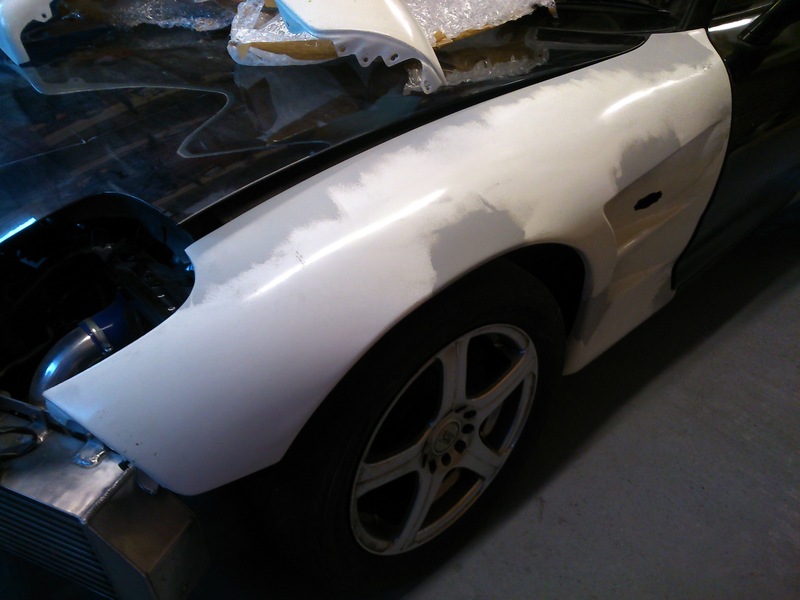 So to start with I decided to strip the car right down to make painting easier and more thorough. 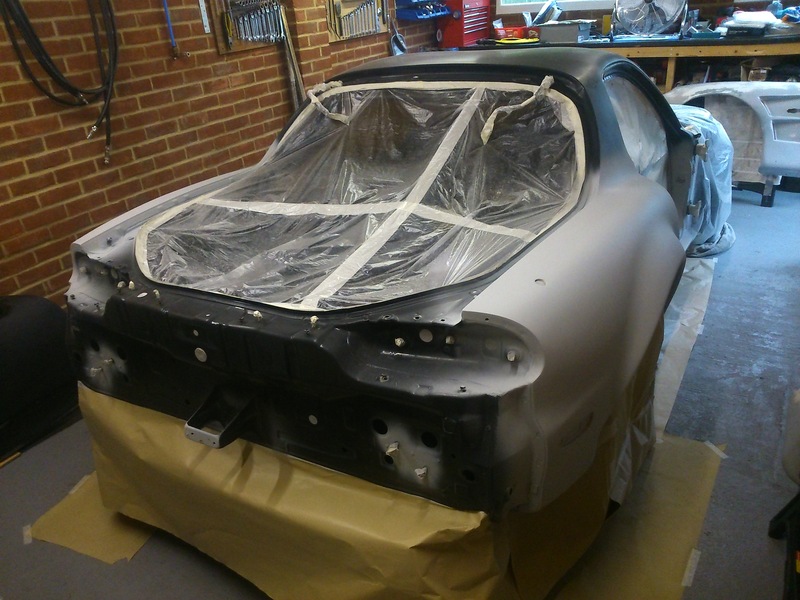 Then it was down to a complete flatting of the bodywork and a thorough degrease ready for masking and then priming. 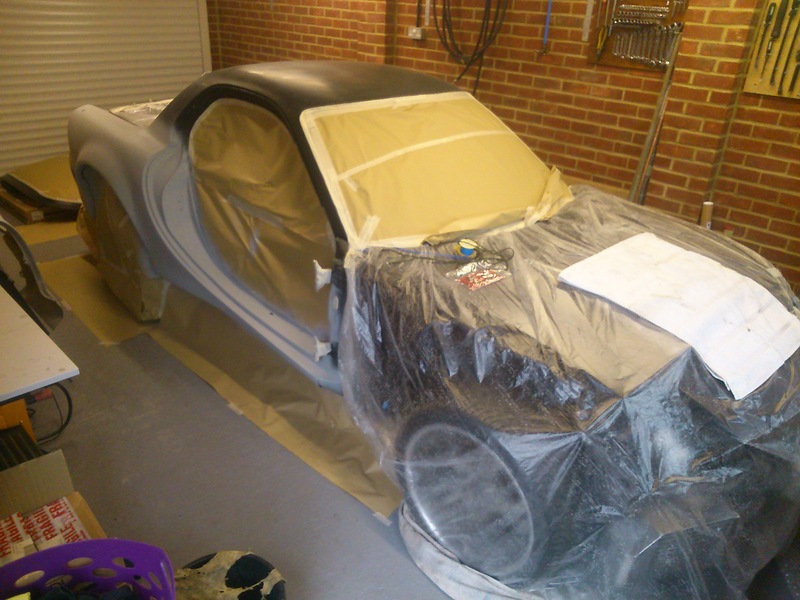 Time for a little more flatting and a good wipe down to remove all the over-spray ready for some colour. With the warm weather still holding out I was in luck. 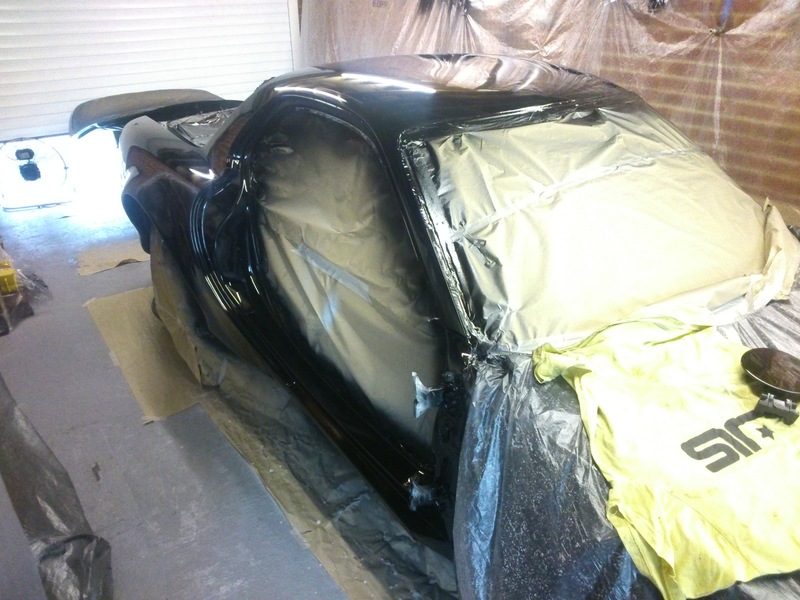 I was colour coating the car with Mipa Super black direct gloss 2k paint. This had been recommended to me by a couple of people for a real deep dark finish. On the face of it it might look nice but this is where the issues started! If you look closely in the next picture you can see the level of orange peel in the finish. 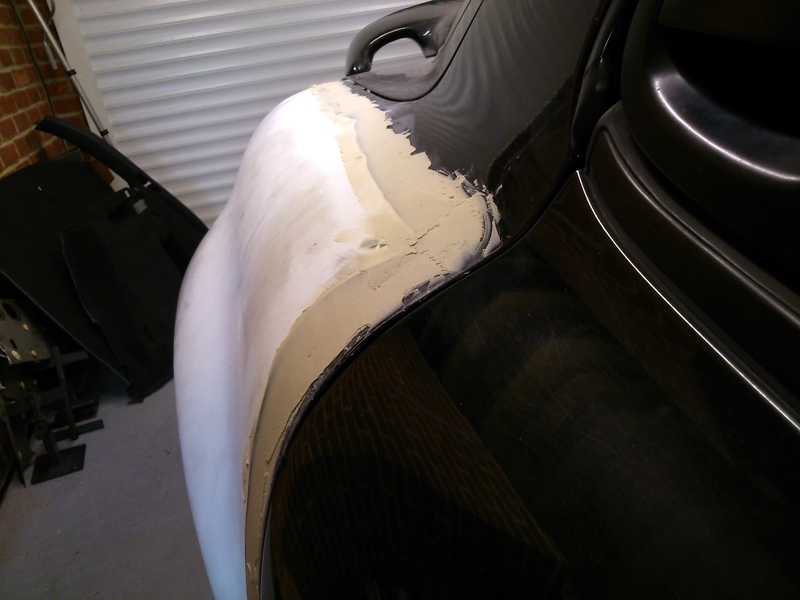 This in itself would not be massive issue other than a bit of work to flat out and polish. 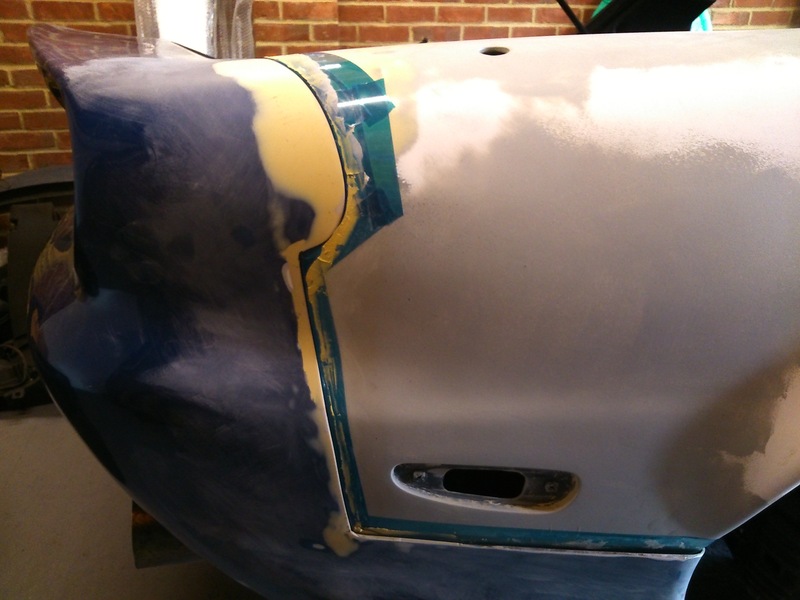 However, while spraying the tailgate I had noticed an issue with the spray gun I was using so had to stop and swap to my back-up gun which was not able to put the paint down so smoothly (mistake#2). To counter this I was trying to apply more paint to get it to flow out (mistake#3). As I found out after that was a big mistake. The Mipa paint is a High Solid paint and thick film build on coats can (and did in my case) result in solvent pop amongst other things. A whole catologue of errors on my side due to lack of experience with HS paint and not expecting it to be any different to a regular 2K lacquer. 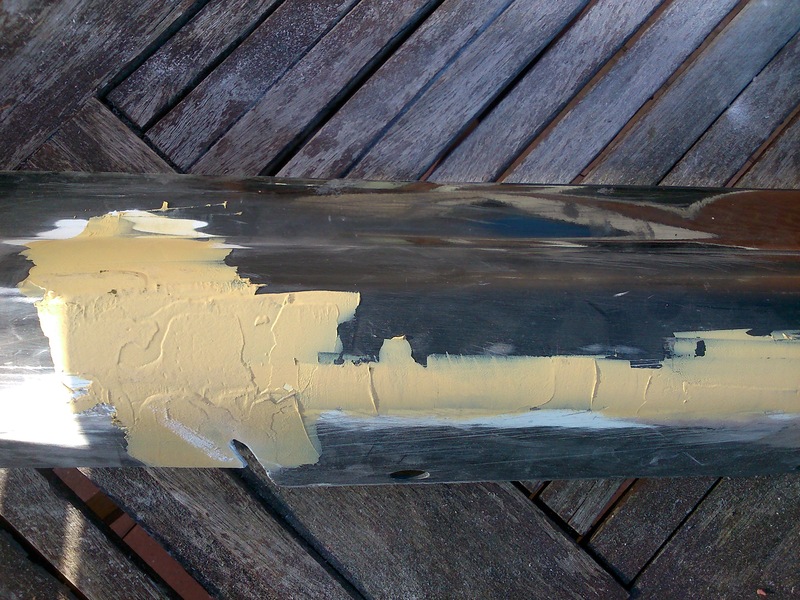 Turns out solvent pop is about the worst issue a painter can come across. Deep joy! The only way around it was to flat back the colour coat and then apply a sealing coat of primer before colour coating again! I was gutted! Fortunately the solvent pop was quite fine so rubbing back with a coarse grit shifted it quite quickly. Before I could start colour coating again I would need to get some proper advice on application of the HS paint and sort my gun out. Plus do some test passes on a scrap panel. I did all of the above. Found out I needed a bigger nozzle and aircap for my gun. 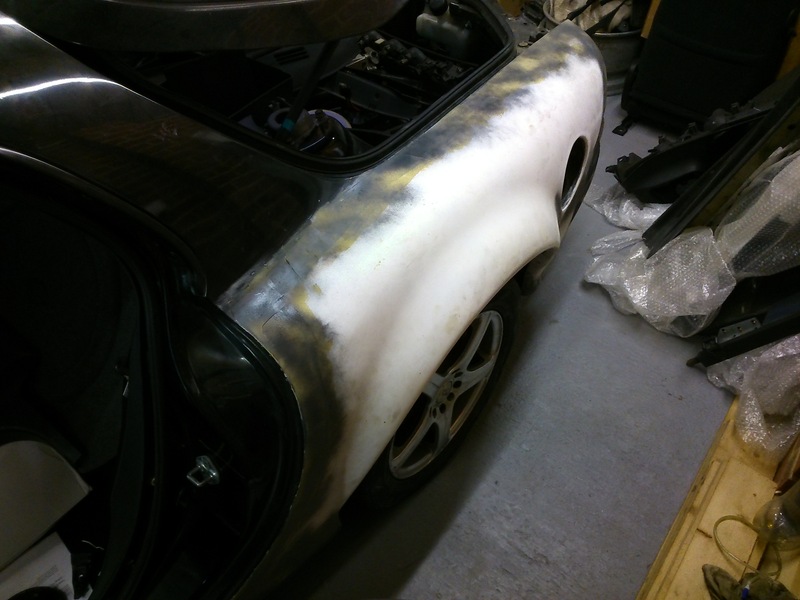 Which in turn showed the existing assembly on it was not matched which had been causing the paint flow issues. I also found out I needed to thin the paint considerably more than the spec recommended which I checked out with a DIN4 paint mixing cup. Once I was happy having run some test panels I was ready to go. This time I thought I would start on some smaller bits to be sure! Wings, sideskirts and mirrors first. Which I was able to do outside in the lovely dry weather we were still having! Now that looks a bit better! A light flat and a polish should have it looking sweet. My run of bad luck continued though, just after I took these pictures and popped out. The gazebo I had up in the garden for painting flipped over in the light breeze and knocked the side skirts over onto the patio! Somehow only minor paint damage was suffered but it looks like one of my crack repairs has opened up so I will have to repair and paint at least one of the skirts again. I literally could not believe it! The nightmare continues! I was now able to get on and prep and re-paint the body and tailgate starting with a fresh 2k Primer to make sure the reaction was taken care of and sealed I also chose a black primer this time instead of grey. And then finally on to the colour with my tried and tested thinner paint mix! That was more like it! Still a quick flat and polish would be required to get that glass like finish. a couple of areas with some minor orange peel coming through after it settled but nothing abnormal. I was much happier. Even if it had been a painful journey to get here! The warm weather was rapidly coming to an end so I decided to quit where I was with the painting and get a bit of flatting and polishing done before moving on to some mechanical bits over the winter. 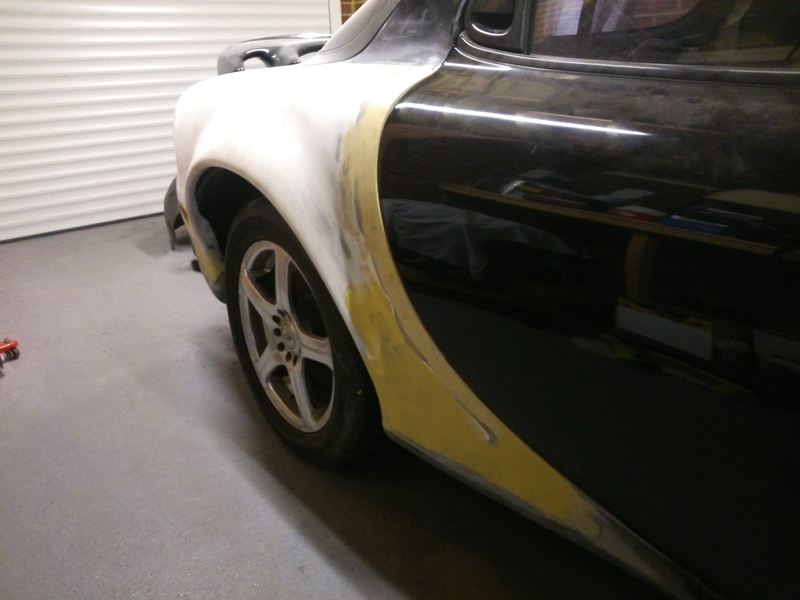 I gave the car, tailgate and doors a go over with 1500, 2000 and 3000 wet and dry followed by a fast cut compound and then a medium compound. I was very pleased with the result. a few bits would need a quick go over again before fine compound and ultra fine finishing. 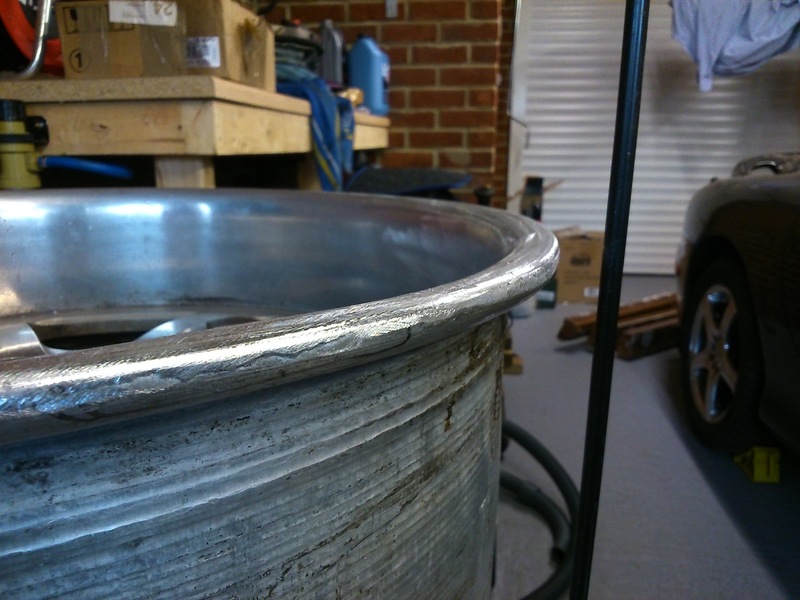 Considering I was still only second stage polishing at the moment I was really pleased with how it was coming out. 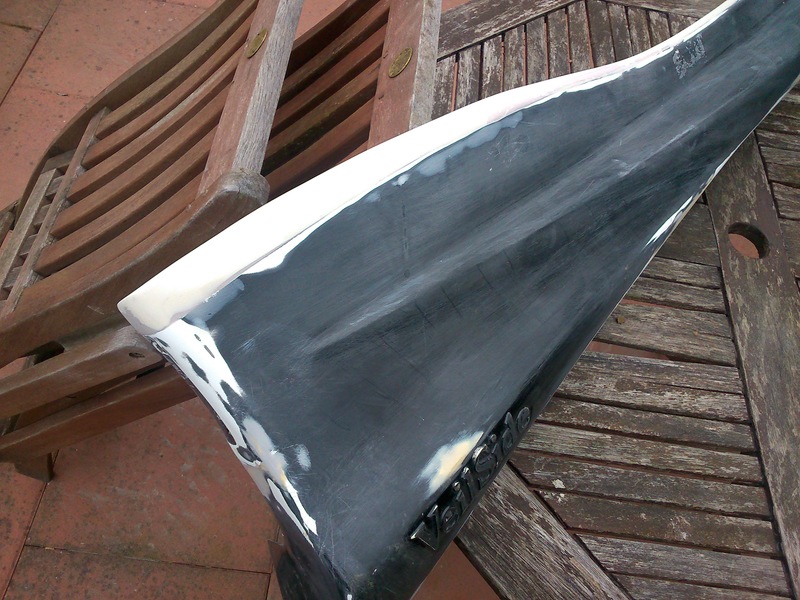 Other than a couple of areas I managed to blow right through the paint on a couple of edges anyway! I would have to touch that in when the warm weather returns. 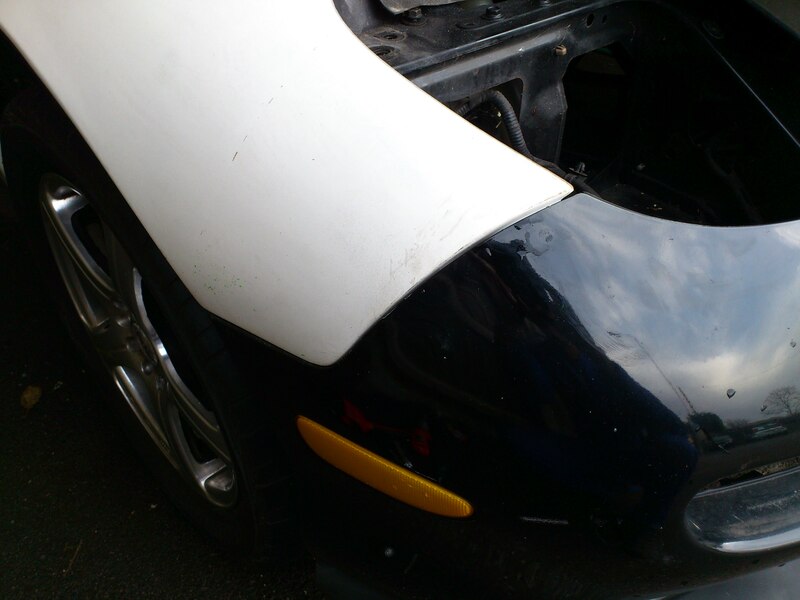 Finally I could unmask the car and put some bits back together! Never thought I would see the day! It was time to leave the paint and finishing to one side and get some cold weather jobs done! First to get started was some pretty serious bonnet modification. With the 20B engine sitting in the stock position and running the standard inlet manifolds it meant that the bonnet was no where near closing! I toyed with a few options and might look at some of these again down the road but for now there was one solution. I would need to fabricate a bulge of some sort in the bonnet to clear the Upper Inlet Manifold and elbow. 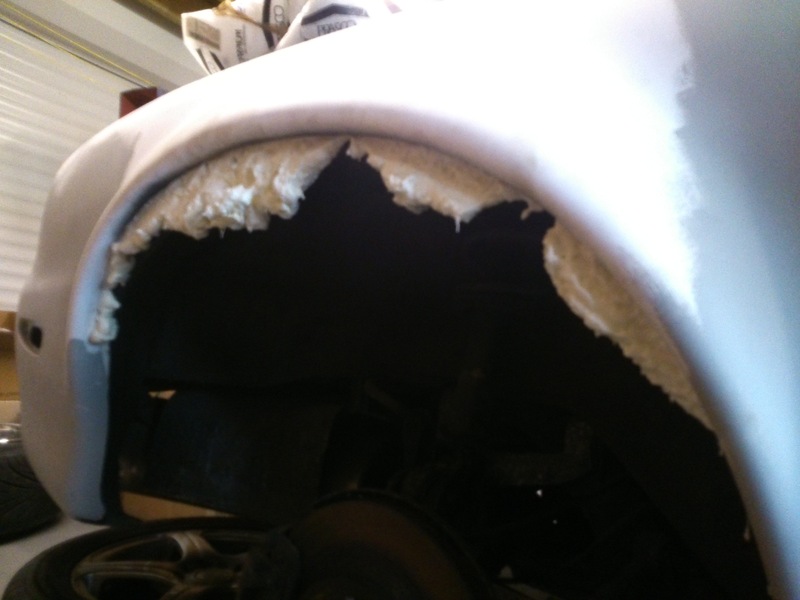 I did debate long and hard over what to do but eventually got brave and took an angel grinder to my bonnet cutting away most of the backing structure and then a large flap which would be the start of my bulge! In fact if you paid attention I think there was a sneak peak further up the page. 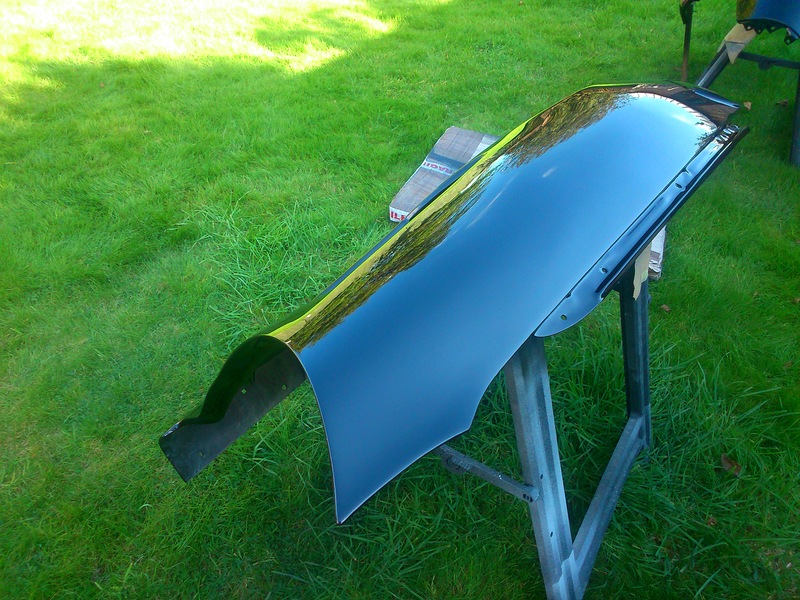 The bonnet is aluminium which makes it easy to cut and work with. 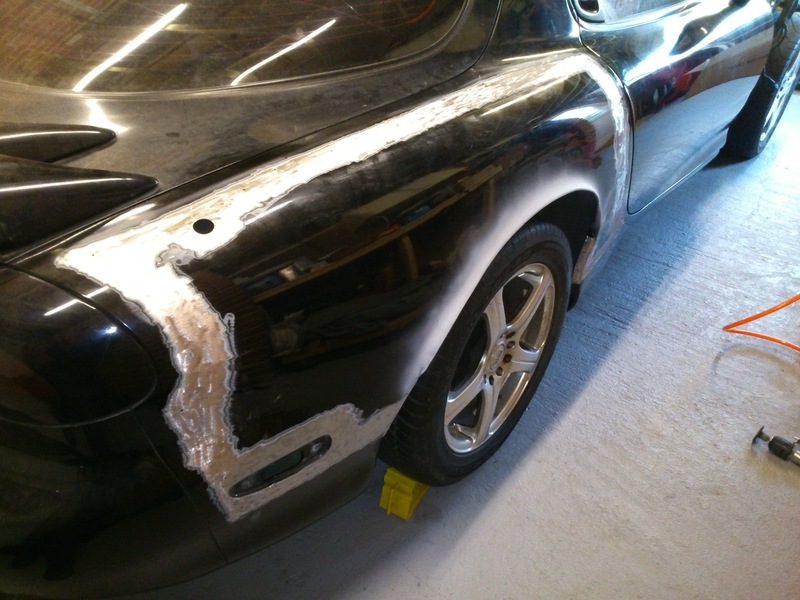 I used a steel strip as a cutting guide which I clamped to the bonnet. 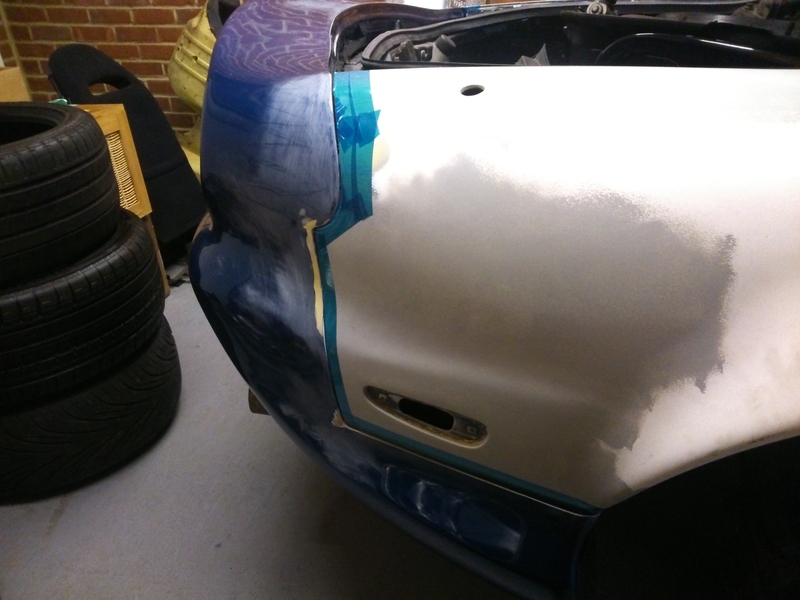 When fitted back on the car it became much easier to see where the clearance issues were.I was very glad my measurements had worked out though as no clashes remained! Then the fun began. I had to do a bit of forming on the flap to shape it slightly and then make up some sides. 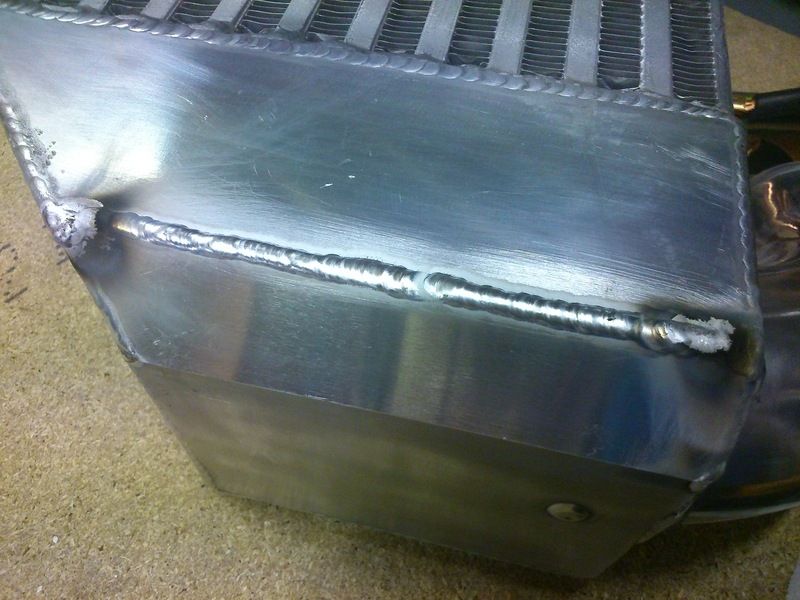 The idea being I would tig weld it all back together and have a nice strong bonnet at the end of the day. 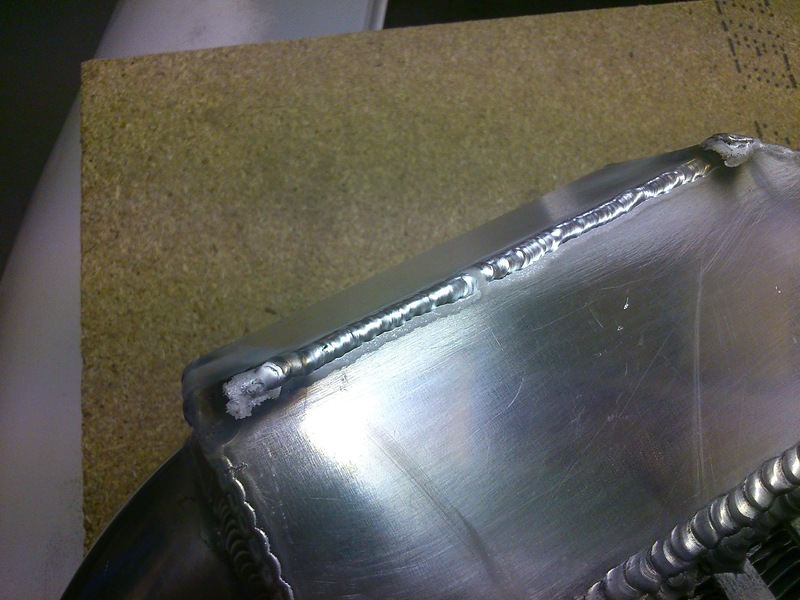 Ally tig welding was still something relatively new to me and no one told me how hard welding thin sheet was! just tacking the sides in place with out the distorting all over the place was a complete mission and everything had to be supported each step of the way. 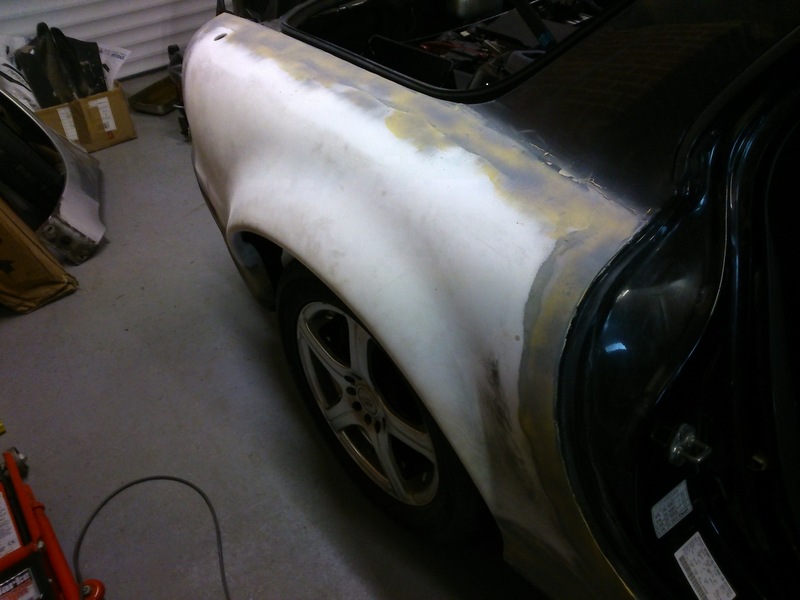 After a few kg of filler rod and a bottle of gas I had the sides welding in place from the outside. Now all I had to do was weld it up from the inside too! This would allow me to dress the external welds back and create nice rads hopefully. I also needed to close off the front of the bulge as I was not planning on leaving this as a vent. The vents would be a separate fabrication later following something along the lines of what was marked out on the bonnet. Now it was starting to take some kid of shape! 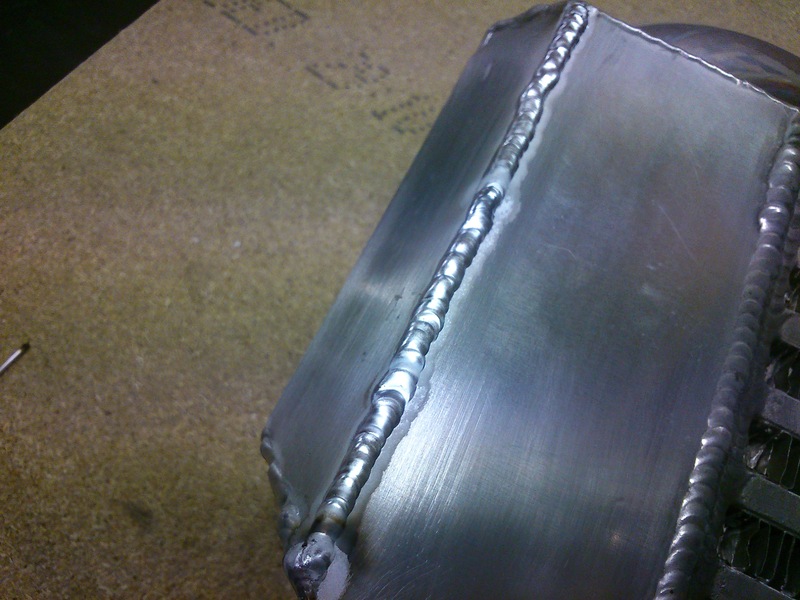 I could start grinding back the welds now to get the final shape and add filler to blend it all in nicer. Well this was still a work in progress and would need a lot of filling and fairing to get it where I wanted. Weather had now turned wet so it was time to retreat into the garage and do some mechanicals on the car. With the bonnet still a work in progress one of the things I was kean to try and integrate into it was a cooling panel above the radiator to help draw hot air out from under the bonnet and keep the engine cool. Some of the ideas I sketched out can be seen in the bonnet pictures above. After toying with various off the shelf louvres and ideas about pressing the stock bonnet I decided the best bet was to mould a panel in carbon fibre. Luckily I work for a company that makes carbon parts amongst other things as a composite tool designer! I set about getting some rough surfaces and curvature for the bonnet, then created a CAD model for this and the desired panel. Which I then model some direct tooling for to be cut from some off cuts of epoxy tooling block. and this is what I got. I then rounded up some offcuts of carbon prepreg and set about laminating the material over a few evenings. Once done it was then vacuum bagged cured and cooked in an autoclave. The resulting part looks like this at demould. Then after a bit of a trim up it was ready for some lacquer. Just need to get the bonnet finished to put it in! 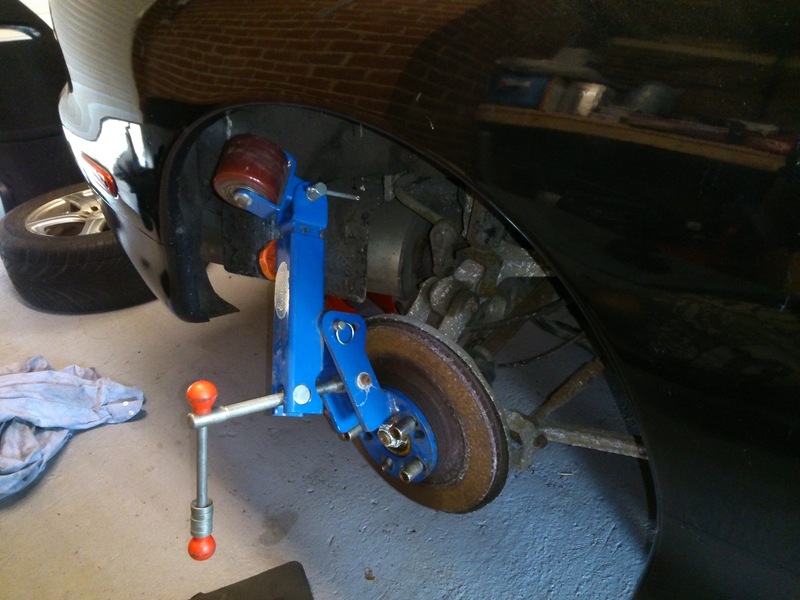 Having refurbed the rear wheels a little while ago the winter weather was a good time to crack out the front wheels and give them a go over as well. 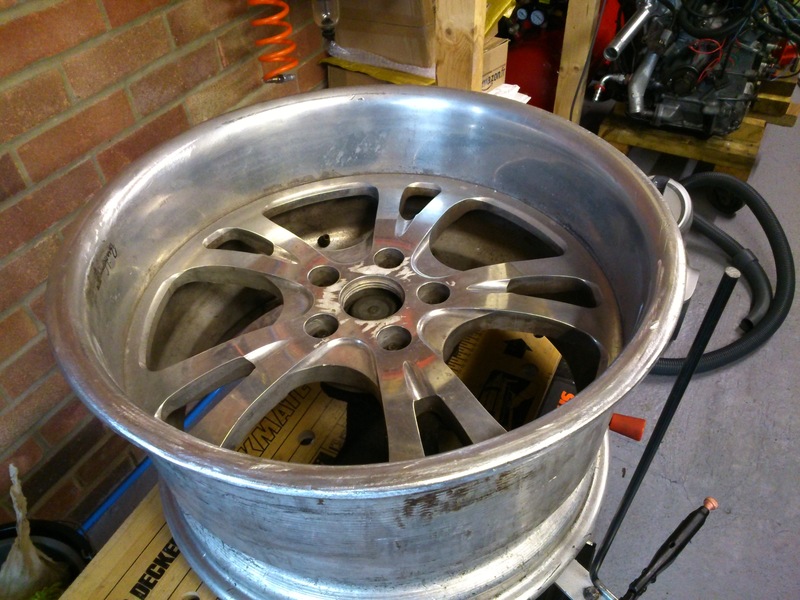 As with the rears I rubbed these back with 400grit and up through the grades to 2000grit before getting the polishing wheels out. The surfaces of the lips was slightly pitted by comparison to the rears but still came up pretty good. Plenty of polish and some very sore fingers! If you hadn’t noticed I quite like shiny things. So I thought while I was out with the polish I might as well strip down the turbo compressor housing and give that a good going over! I was toying with painting it but thought the polished look would be the better way to go. I must say this job definitely goes on the list of ‘Jobs I wish I’d never started’! The cast finish was horrendous as was the porousness of it! but it got there in the end. Still some pit marks if you get up close but the more you rub the more you seem to expose so it seems! So this is what I started with. You can clearly see how course the casting is. Plus how fiddly some of the detail is to get around! Next step involved going down through the grades with various wheels, flappers and wet and dry paper from 240 grit, 400 grit, 600 grit, 800 grit and then 1200 grit. I also chose to go with 1500 grit and 2000 grit at the end to make polishing up better. I don’t think that is really needed if you can easily get everywhere with proper polishing wheels. If I thought my fingers were sore doing the wheels OMG! literally raw! Last of all I cracked out all the polishing bits I had plus some new stuff to try and get into as much as I could with powered tools and leave as little as possible for my sore fingers to do! Then all bolted back on the car! Big Grin!! Just the inlet manifold to do now!! Haa haa! With doors on but the matt black OEM handle looking a bit tired I debated and decided to give them a once over an do them body colour. Wasn’t sure if it would look right or not but what the hell! Out of interest and to see if it would give the black a bit more protection I decided to go over these with clear lacquer as well. and I did the fuel hatch while I was at it. The bits that are probably going to get handled the most. It didn’t make a noticeable difference to the colour or shine but it certainly didn’t hurt! 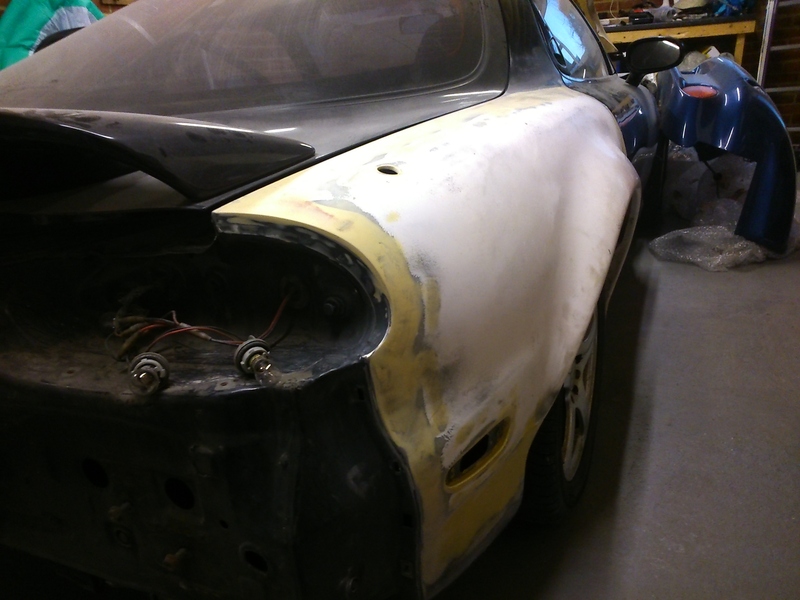 It was time to push on with the bodywork and get it finished off and fitted up while the summer was here! For once I decided if I stood any chance of getting it together before the summer was out I needed to draft in some help. 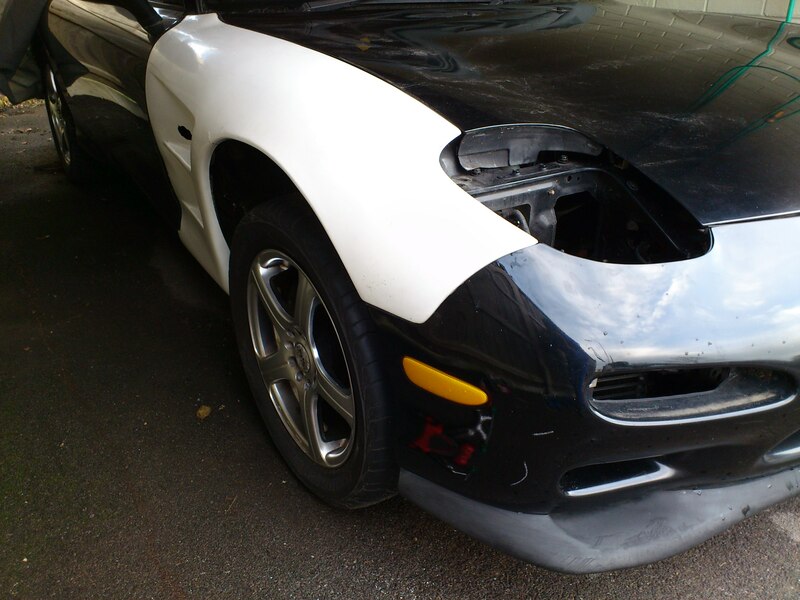 I could no longer paint in the garage with the car in there and not enough space so I decided to get a the front and rear bumpers painted at a local paint shop. I had got them pretty much prepped and ready to go so managed to negotiate a good price. 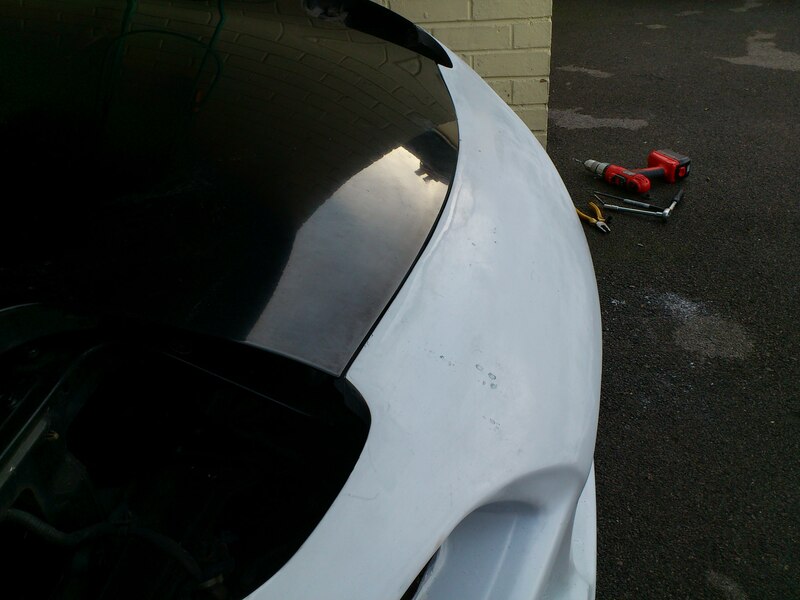 I was pleased with the job but still gave them a flat a polish at home to match the rest of the car so far. 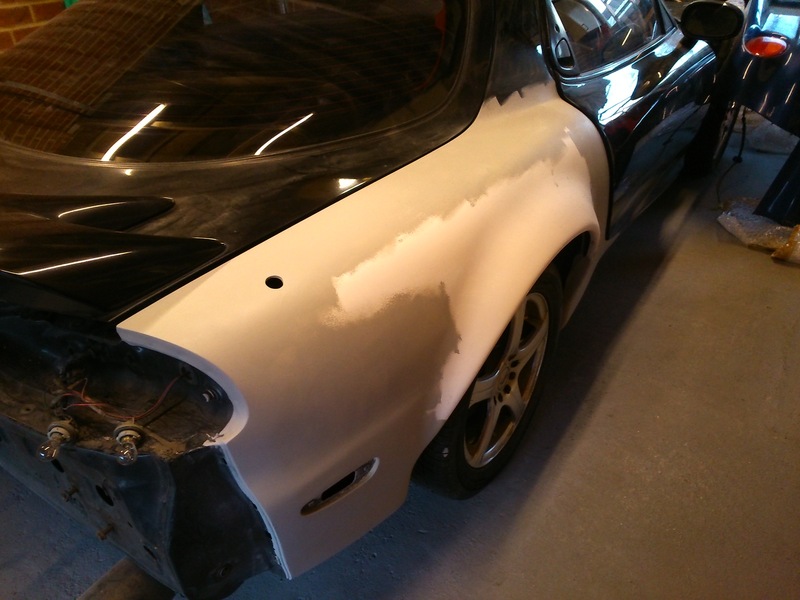 I started with the rear to get that done. Decided for some reason I would work from the back forwards putting it all together!? 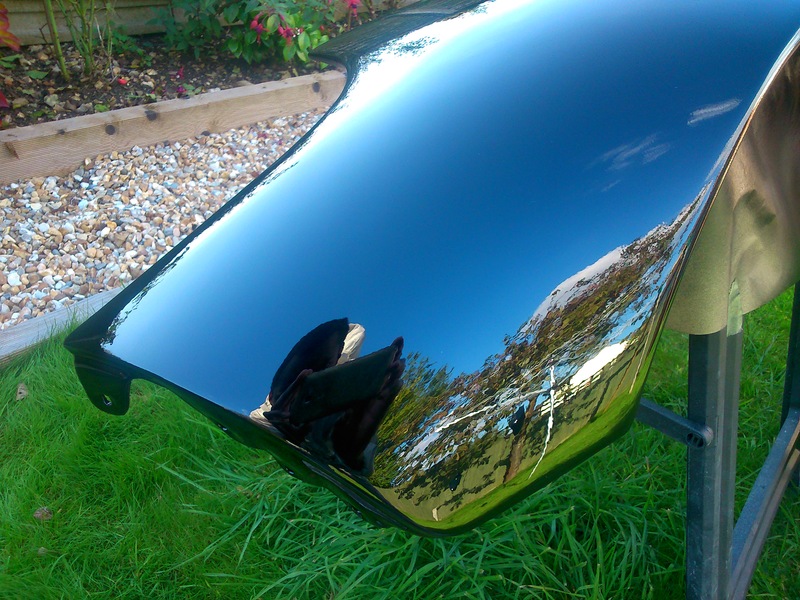 After a compound and fine polish at home the shine gloss was super deep and lush! So it was time final to put a large part of the car back in place. I made sure I had sorted all the wiring for the lights including the rear number plate illumination as it would be a real pain to pull it all off having forgot to feed any of those wires! While I was at it with the polishing I thought it would be a good time to give the rest of the main body a go over with compound and fine polish properly. It had been done quickly before but still needed some work. 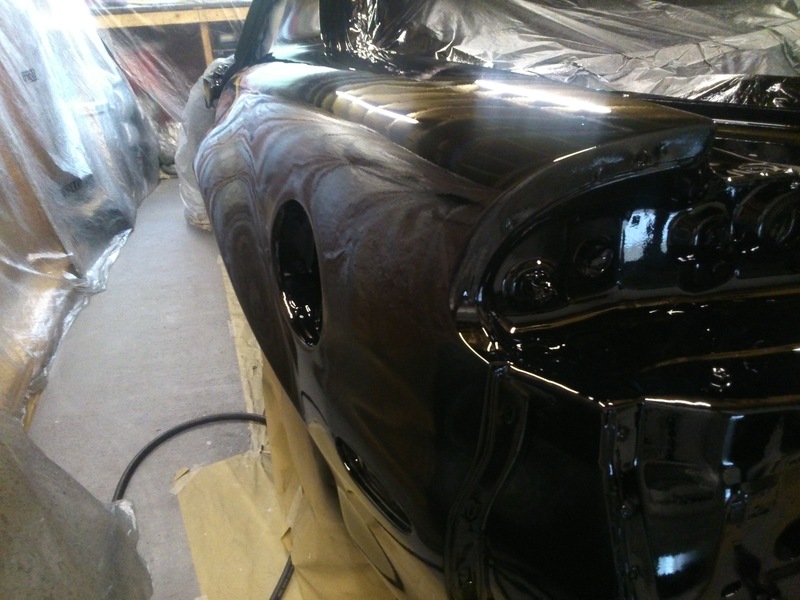 The jet black shines up so nicely once you hit it with the fine polish and get all the swirl marks out! I was very pleased. 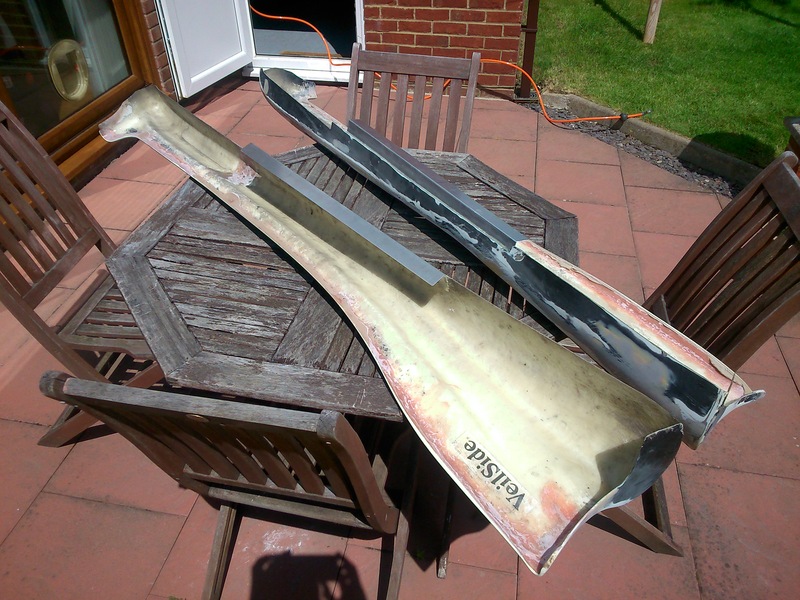 The front wings had been painted since last year as well so I thought it was time to pull them out of the shed and give them a buff up and get them fitted! I reckon the paint should be hard by now! You just want to lick it right?! Maybe that’s just me! And on to the fitting! Okay. So the fitting of the wings did not quite go to plan and threw a rather large spanner in the works. My front wheels did not fit!! You must me kidding me I hear you say.. Well I can tell you that’s exactly what I said plus a few other choice words! 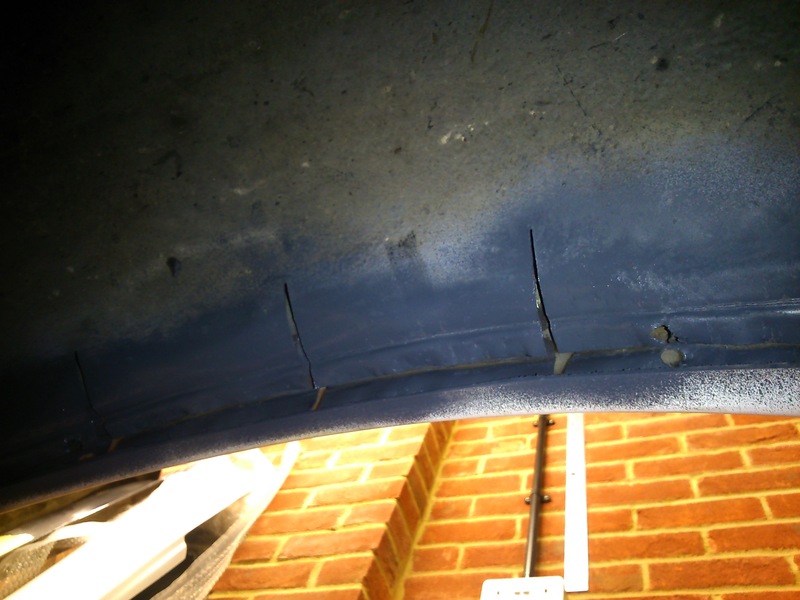 The ET0 offset proved to be a bit much and the tyre crashed into the arch on lock ! looks like it would when the suspension compresses too. You can kind of see in the picture above the wheel is sticking out from the arch. How I did not notice this before I don’t know. The car has largely been without wings firstly and secondly the wheels came with some super stretched and very low profiled tires. Hence they might have just cleared with that. I was not prepared to cut and mod the arches to try and gain clearance which might just work. So looks like after hours of bleeding fingers polishing them u the rims would have to go in place of something new! Watch this space. With all this new shinyness I thought I would treat the car to a jazzy cover to keep the dust off while the rest of it came together! I started creating my modified bonnet some time ago now. it was time to get stuck in and finish it! So copious amounts, grinding, filing, filling, rubbing, filling, rubbing etc I ended up with something close to what I was looking for. Also time to cut a hole for the carbon vent to go in! no going back now! 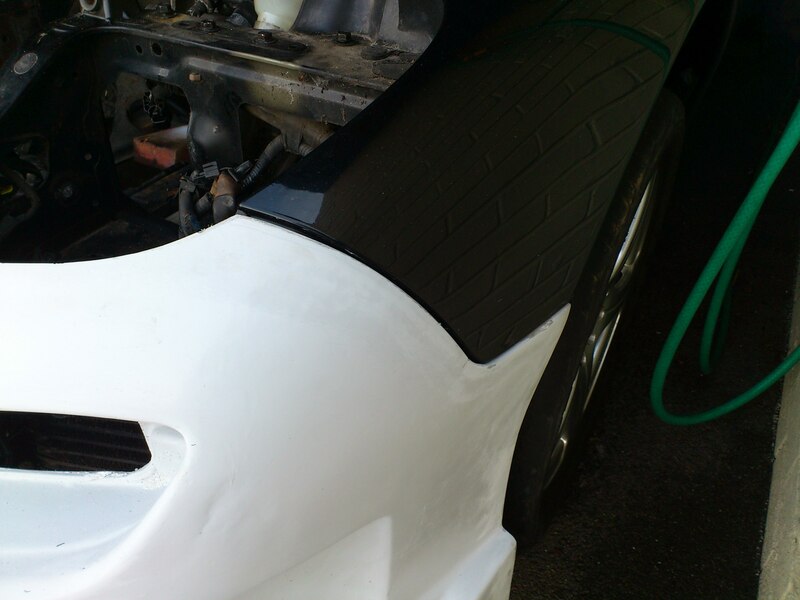 I also wanted some cooling vents towards the rear of the bonnet to help draw air out of the back. I had been looking around for off the shelf things but nothing quite suited. I then stumbled on a YouTube video of how to from shark gill vents in metal and thought they looked just right for what I was after. So I set about making a forming tool and a suitable mandrel and once again I would have to take the bull by horns! I did a quick test piece first to see if it stood a chance of working and then.. Well I just went for it! My angle grinder really seems to have a dislike for this bonnet! Slots cut in and then on to forming the vents. A bit of tickling with various forming tools and hammers and the vents were looking pretty sweet. 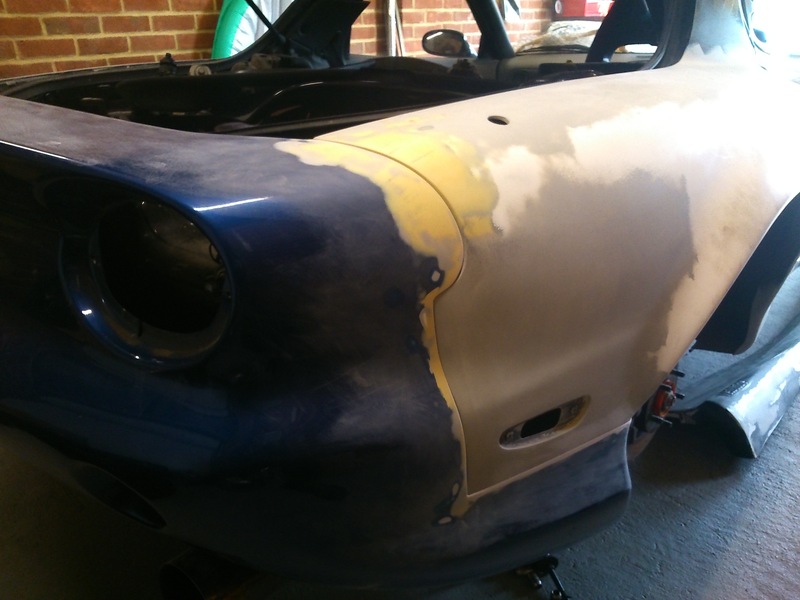 Time for a little bit more filling a prep ready for some paint.. OMG! Yes! finally! I planned to give it a few coats of high build primer and a good block between coats to take out any smaller low spots and imperfections with any luck. 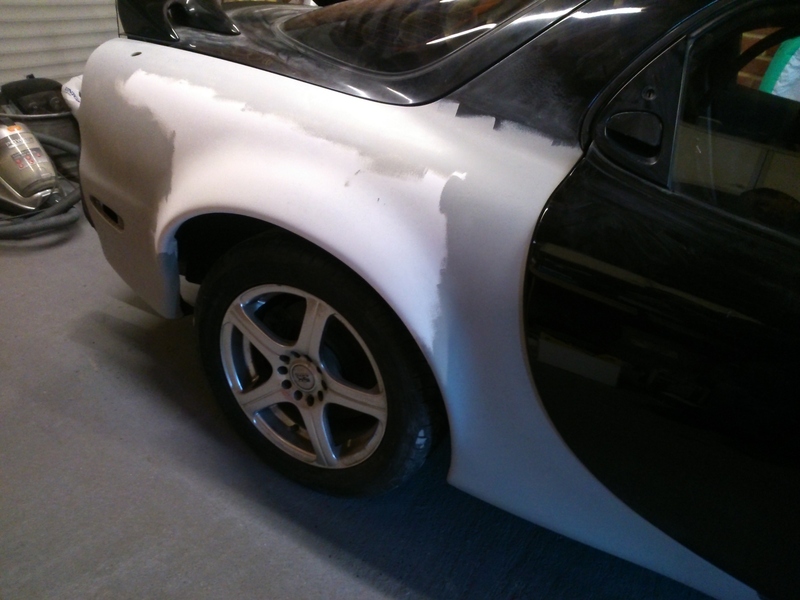 But I expecting the top coat to show up some unevenness in the panel after all this bashing and welding! We will see. After about 3 coats and flats it was actually looking pretty good. At least in matt finish it was! 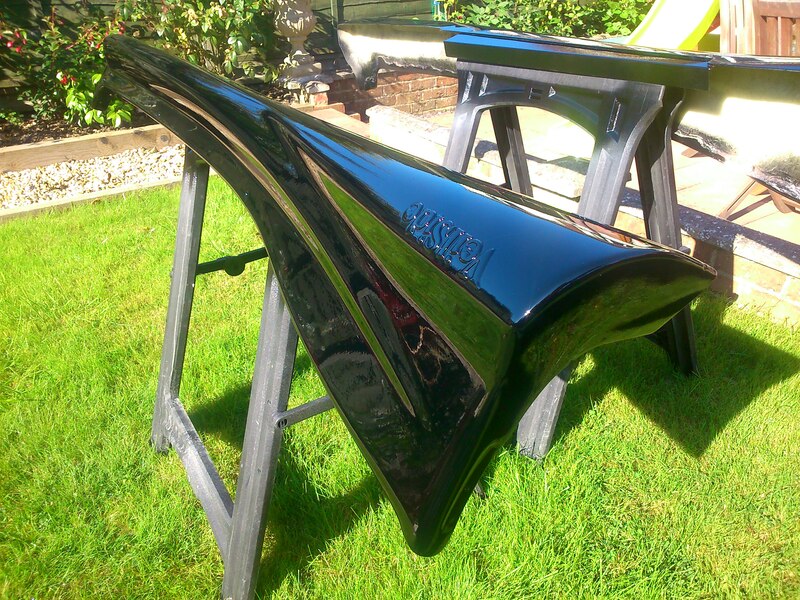 Time to get on with the gloss black and the moment of truth! After some initial issues with a lot of debris in the paint and subsequent marks in the top coat I ended up getting a bit of help from a very friendly sprayer who was interested in my project and working in the booth next door to the one I borrowed. The result off the gun (above) was very impressive. So big thank you to him. 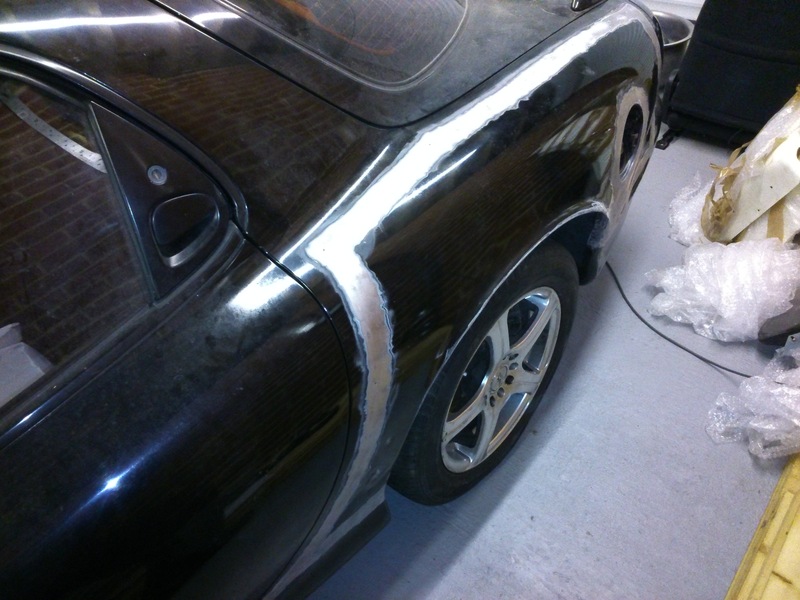 I opted for a lacquer over the top as well for a bit of added protection against stone chipping hopefully. There were a couple of little bits to flat out and of course I would flat and polish it to match the rest of the car anyway! 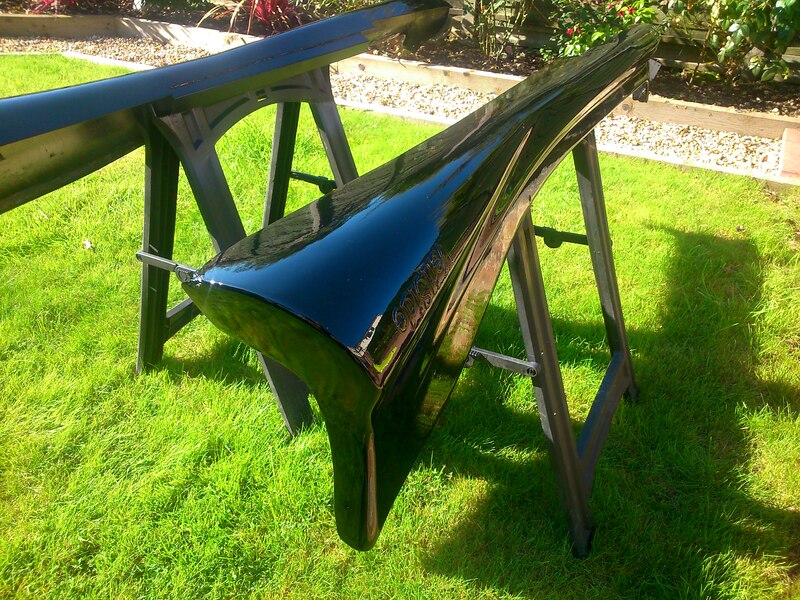 The anti-scratch lacquer certainly was hard work to polish up but worth every bit of effort. I was absolutely over the moon with the outcome after such a lot of work. I opted to fit the vent in with some screws so it can come out if ever needed for any reason. The carbon looks so grey against the jet black! Finally it was time to bolt it back on the car.. The car almost has a front end! Another bit out of storage and back on the car. It is actually taking shape. Front Bumper next I guess? 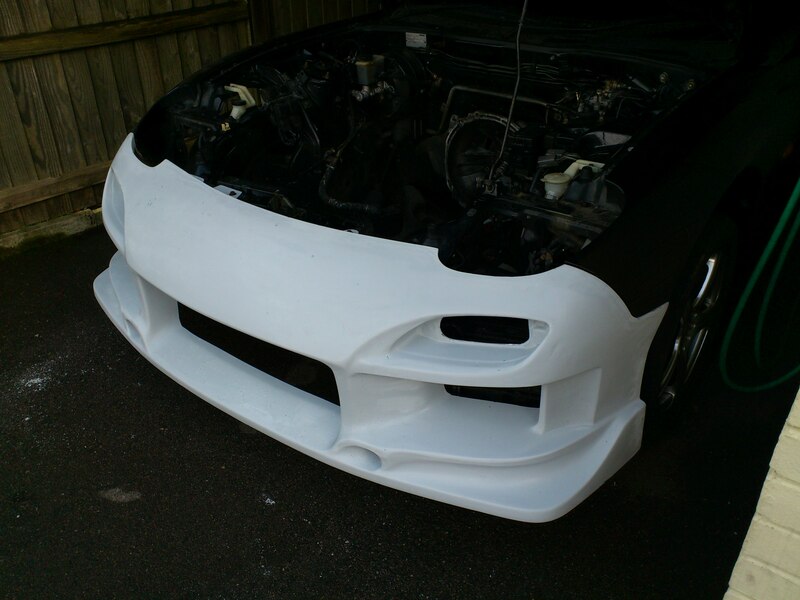 The front bumper was one of the parts I drafted in some outside help to get painted a little earlier in the year along with the rear bumper. it had been sat gather dust for a while. Weather was on a bit of a roll so time to get it out and give it a go over with a my 3000 trizact pads and go through the polish grades. 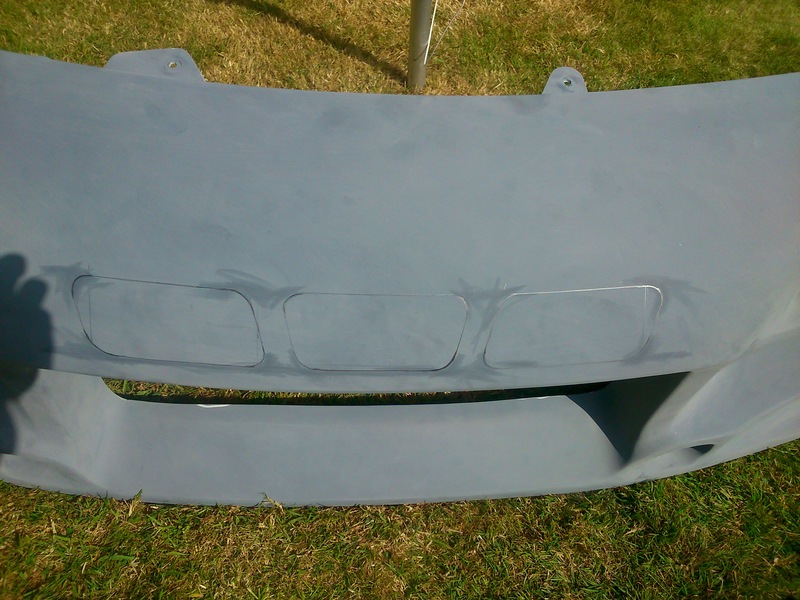 Also noticed the painter had missed a couple of inner return faces on the bumper so I masked the rest out and gave these a quick blow in. Well, it’s got to go somewhere!. There will be mesh going in the upper cut-outs eventually. For now I was going to fit it up as it is as I was so excited to see what it looked like on! It’s just hung on a couple of bolts for now and I guess it looks okay!! I finally have a front end! 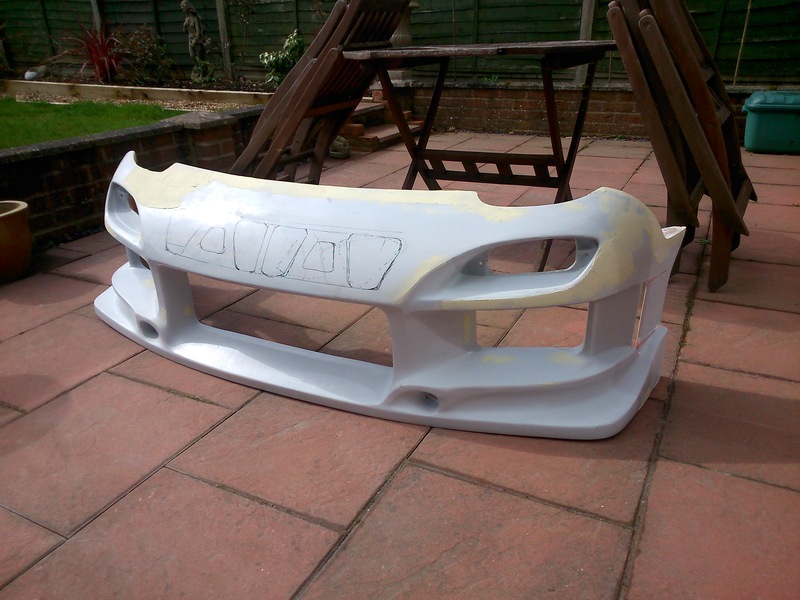 So time to finish off the last few bits on the front end now. My REA Sleek copy lights were looking a bit sorry for themselves so I decided to pull them right apart and give them a freshen up and get them fitting a bit better too! With the lights apart I ground away some areas that seemed to be hindering a good fit and primed up the body and polished the light covers. I then made up some new brackets for the back of the lights as the ones they come with mean you have to cut away or remove a bit of the seal around the bonnet which I didn’t want to do. You can see the new bracket sitting under the back ledge of the light picking up an existing fixing point for the factory lights. 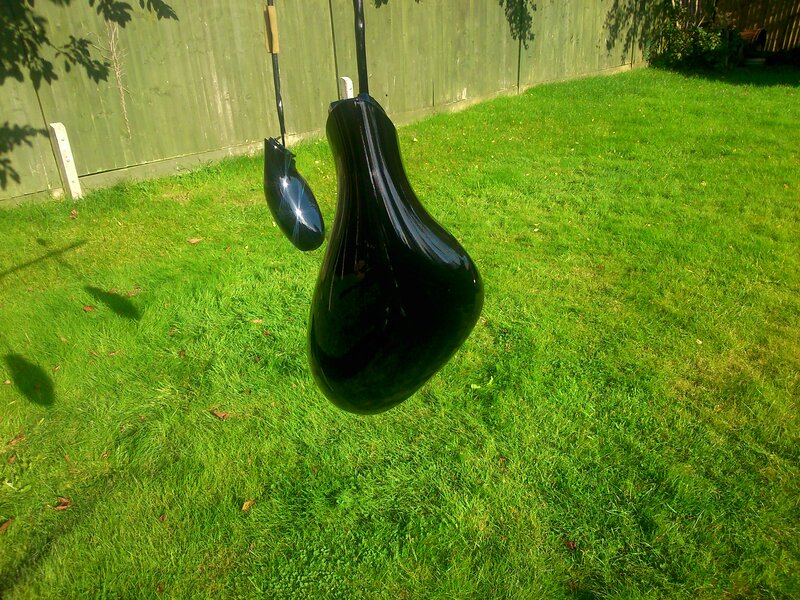 Once I was happy with the fitting I gave them a new coat of paint and reassembled. I adjusted them up in the garage with some measurements I found online but will have to leave the covers loose until I can get this done properly at the MOT station! 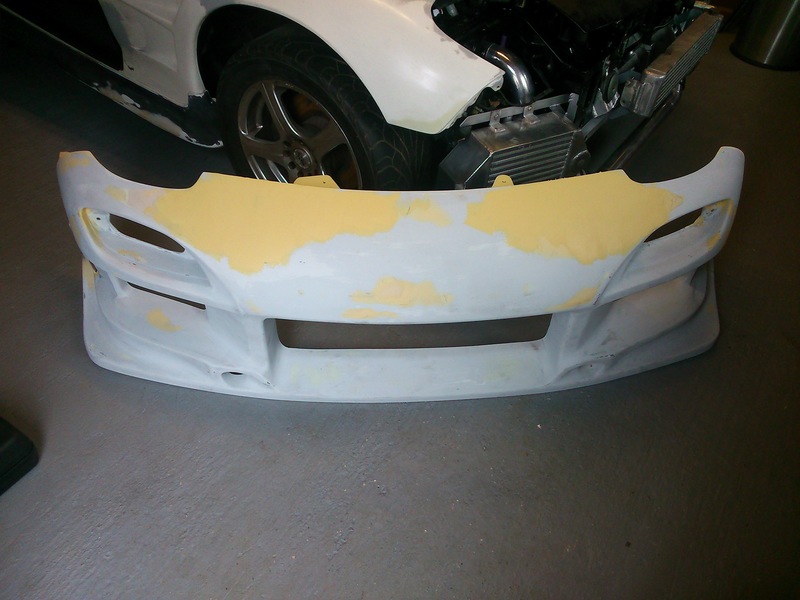 The front bumper had a last finishing touch needed on it as well. Some mesh in the vent holes at the top. I ordered some in and bonded it in place with a PU adhesive which I have found works best in the past. So the front end was pretty much there.. One last thing I was not quite happy with yet was the bumper didn’t feel rigidly enough mounted for my likely. So I decided to put my ally welding to the test and make a support bar. This could then hopefully be used to mount some rad ducting to to aid cooling. I used some box and angle to make up a little frame work that I could bolt to to the tow eye brackets and slip into the lip at the bottom of the bumper to hold it out. Please don’t look too closely the welding! Ally is hard work! I then put some rubber pipe on the end pieces to stop them cracking the fibreglass bumper with vibration and gave it a little polish up before drilling some extra holes in the tow eye brackets to mount it. With this in place the whole thing felt much more rigid. As far as the exterior goes this was the closing point for 2016. It’s been a crazy year and sad not to see the car road worthy yet but fingers crossed for 2017! At least it now looks like a car again! I have been shopping around a while trying to decided what to do on the wheel front and after much Uumming and ahhring I settled on a choice. XXR526. They had good dish. Very close on offset specs for what I should need and I really liked the look of them. I have never owned a set of new wheels so it was quite a treat to open up the boxes and see shiny new wheels fresh from the factory! 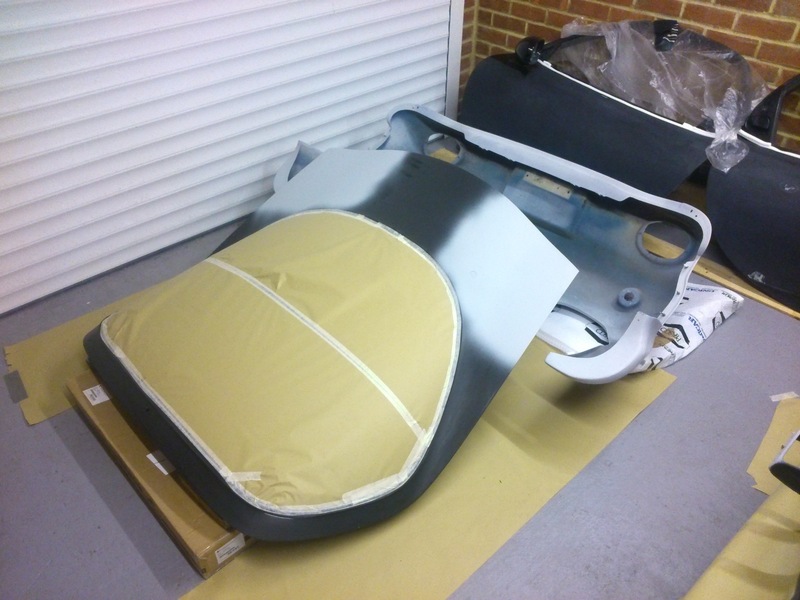 After a quick test fit on the car to check out offsets I then wrapped them in rubber and they were ready to go. I think they finish off the car just nicely! About 30mins later and the front was off ready for loading on a trailer to go to the dyno! See Dyno Day Prt2 on the main triple Rotor build page. I cannot believe I am about to say this but May 2017. The car is ROAD LEGAL! I can drive it! Not 100% done but these kinds of projects never are. i just want to get some miles on my engine and find out what matters I need to attend to over the next winter period! So are putting it all back together again here are a few snaps for you of what she looks like now. And here is a little slideshow with some more scenic ones during MOT and after my first Drive! 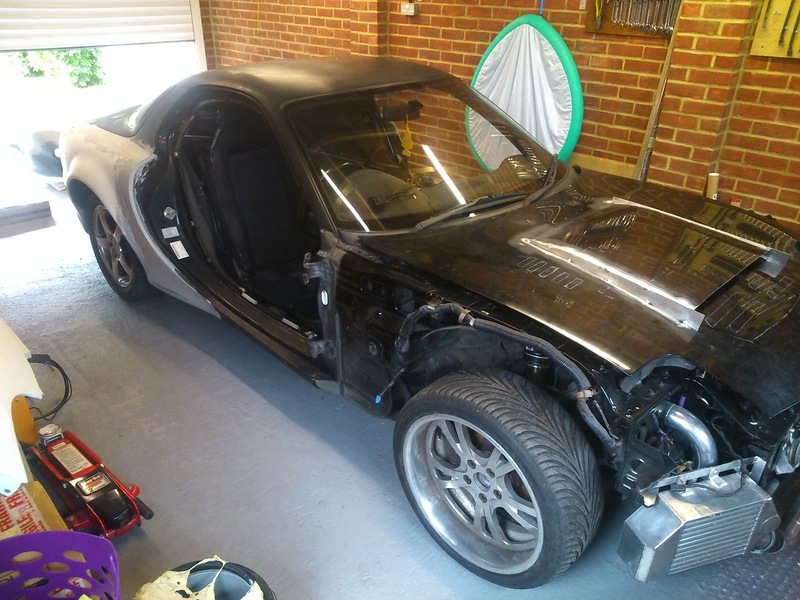 I am going to be doing running in a finishing a few little odd jobs like light lenses, sort out the suspension settings then get the skirts on and try and get a bit of road mapping done along the way and if possible actually enjoying the car. So there may be a little radio silence but I will be back when I have more to report! The exterior was pretty well buttoned up now.. A few touch up bits to do at some point. Maybe over winter, but for the most part it was about there. I wanted something to tidy up in the engine bay area where the bumper mounted and was kind of partly open. 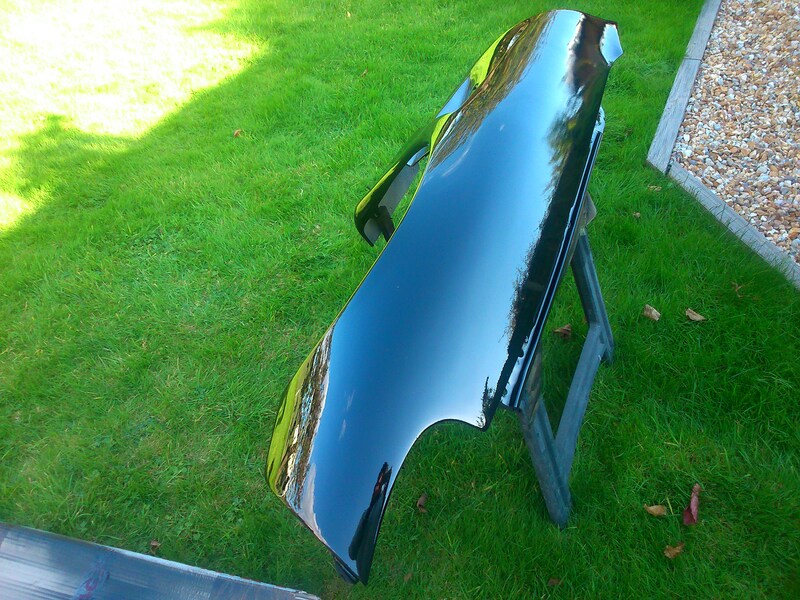 I decided a couple of little carbon panels would work to close it off and make it look more… well.. finish! So out came my offcut stash and I templated the panels in cardboard prior to committing the air saw to my carbon plate! Just need to work on some stickers and lacquer to finish these off and I will post the results up in an update soon. Okay.. So a bit of a story behind this.. My nice new XXR526 I had turned out to have s bit of run-out on the stainless lips on the fronts. After a couple of attempts by one shop to balance them I took them elsewhere and first spin on the machine they said.. err these are bent! Turned out is was just the outer part of the lip which I guess is a pressed/pushed in sleeve. Got back on to the suppliers SRB Power who agreed to have them back and check it out even though I had had them over 6months.. Allbeit not used! First they checked them and said there was nothing wrong. Then when I asked them to look again they agreed there was runout and although they thought it was acceptable they would replace the wheels. 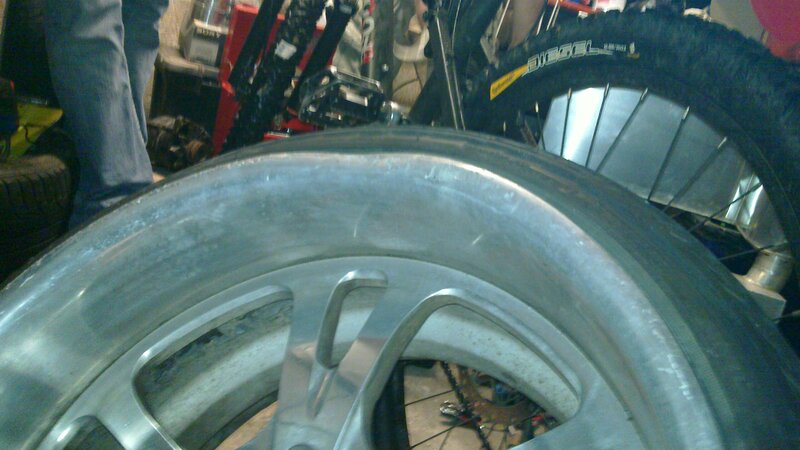 But problem was they had had issues with damage in the warehouse so had no stock of the wheel size I needed on the XXR526. 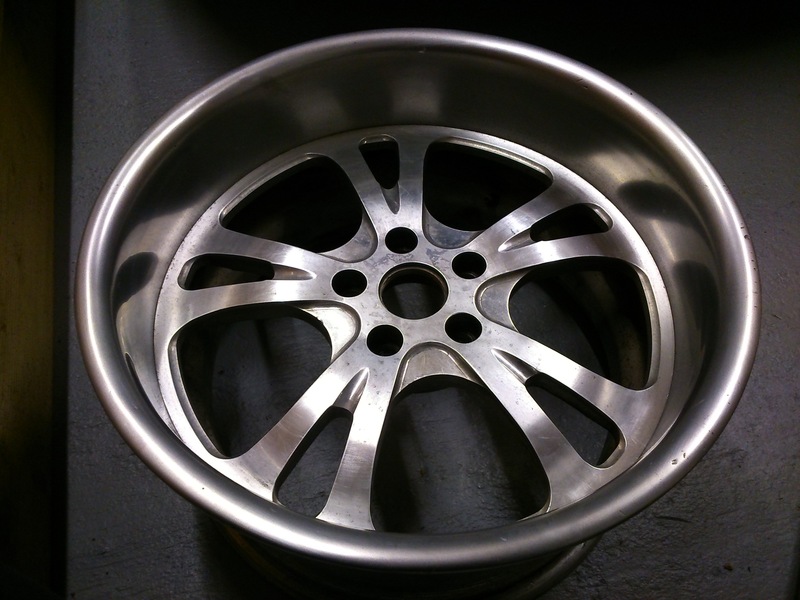 After being told I could look for an alternative style and they would replace the whole set my beady eye caught hold of a new wheel model XXR527D in platinum with machined spokes. Only the most expensive set! I eventually came to a reluctant agreement with the supplier to pay a bit extra and get the new wheels. Just opening the box I was blown away! So after a couple of coats of wheels wax and a spot of tire black it was time to get the fitted up. And then out to show off my new wheels and get a few nicer snaps! And here are a few more nice pictures from an RX7 meet I attended in Guildford today! Yes I finally got to a meet! Last one for the year as well I think! October 2017! I almost forgot.. not a biggy but I got my carbon closing panels finished. So far I decided to keep them free of stickers but I might change my mind later. 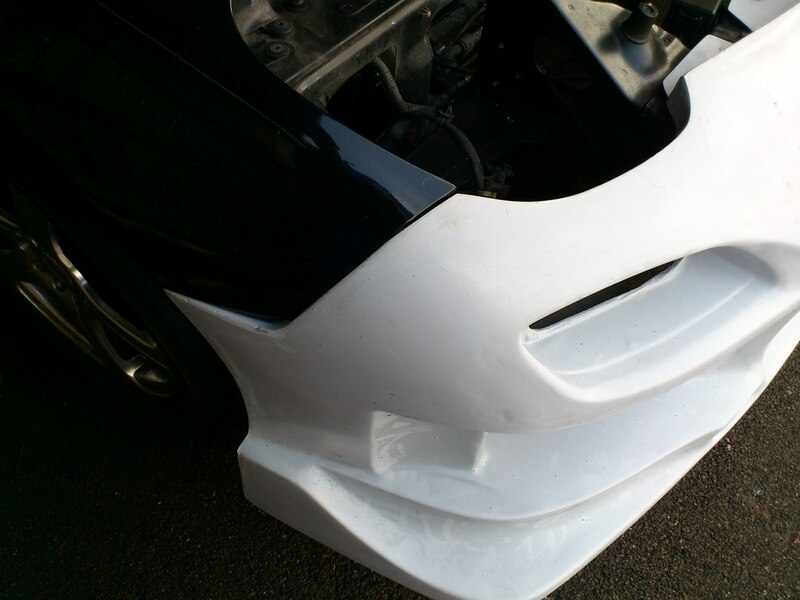 Just makes it look a bit neater around the top of the bumper now. What?! I hear you say.. Well it is my new phone I imported from China after a tip off from a friend and reading some good reviews. I think iphones are massively overpriced and phones in general all seem to have gone up a lot while the choice has come down over the last few years. So if you do your research and know what to look for you can pick up equivalent and in some cases better phones direct from China for a fraction of the price. So what does this have to do with my build? Well.. pretty much my main criteria on the phone was a decent camera as largely speaking that is what I use do document my builds and post pics to facebook. So of course I needed to try it out! 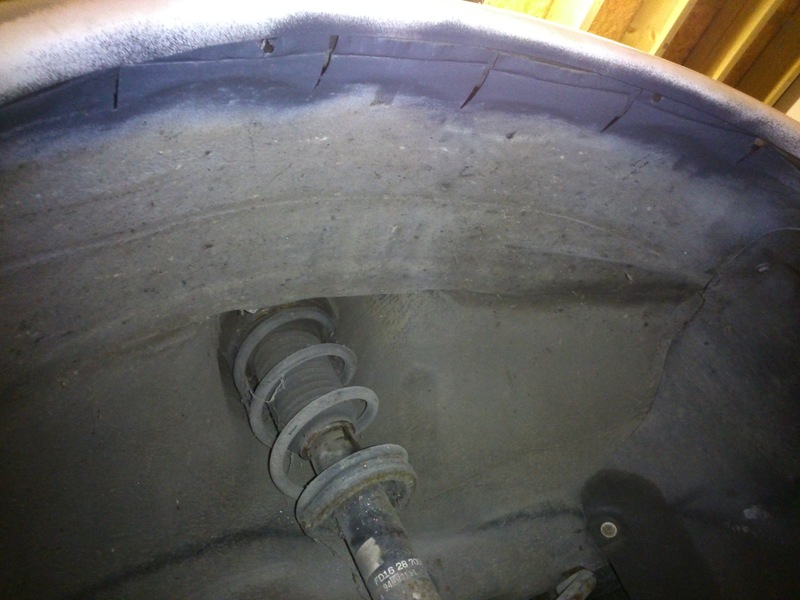 Car now had it’s new HKS suspension fitted which you can read about in the main build page. so I took it for a drive to try that out and as it was probably the last sunny day of the year I found a quiet industrial estate to stop and take some snaps! See what you think compared to the others above which are from my Digital SLR in the slide show just above and other than that probably my old phone camera. I must say I am blown away.. far better than I expected. In decent light conditions at least. The last two were actually done in my garage at night under fluorescent lights too and still great quality. These used the Tilt shift blur effect in the camera vast selection of modes. I would almost go as far to say the image quality is better than my digi SLR for good light conditions!? SLR possibly makes the image softer on the eye, but anyway.. The Xiaomi Redmi Note 4 gets 2 thumbs up from me! This is one of my favorite pics from above The car looks much better poised with a few mm more out of the ride height! I recently attended a big car show local to me sponsored by MeGuiars as such I thought I should prep the car up a bit more! I had been looking into ceramic coatings and came across one that advertised itself as a DIY product. 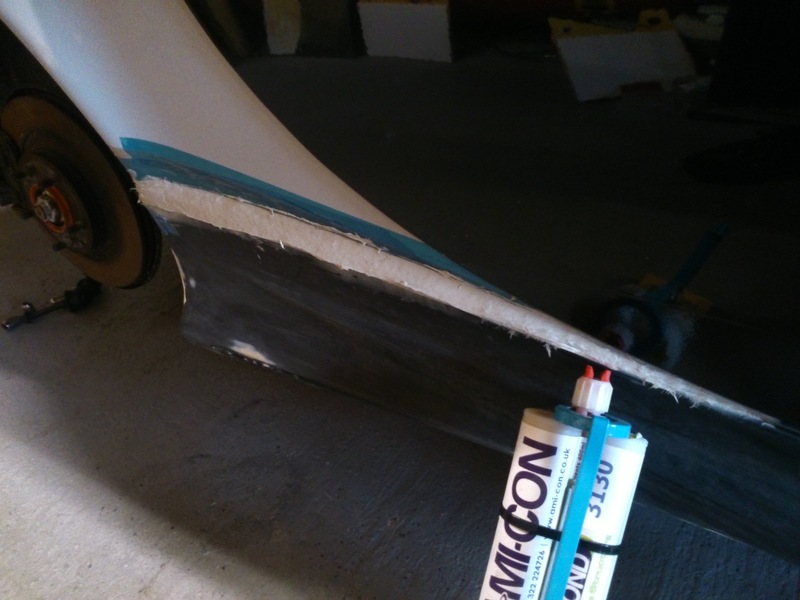 Where most coatings are suggested to be applied by experts. it is called Hydrosilex Recharge and I thought i would give it a whirl. Prep is simple. Good spay wash or alcohol wipe if you can. Couple of ways to apply it, either wet or dry, and both seem pretty straight forward. My car was super shiny to start with but I did find this gave a bit more of something to it. Will see how it protects moving forwards but so far so good. Here is how it looked after. And here are a couple of pics from the show.